The base of a bottle typically only has one primary function (besides helping hold the bottle together) and that is to provide a flat surface for the bottle to stand upright. Of course there are exceptions to that "rule", most notable being the rounded base mineral & soda water bottles whose purpose was to make sure the bottle did not stand upright. One base related feature which is not covered in any depth on this page is the base profile or shape. This is because there is little dating information to be gleaned from simply the base profile, though the profile can assist at times with the typing of a bottle. 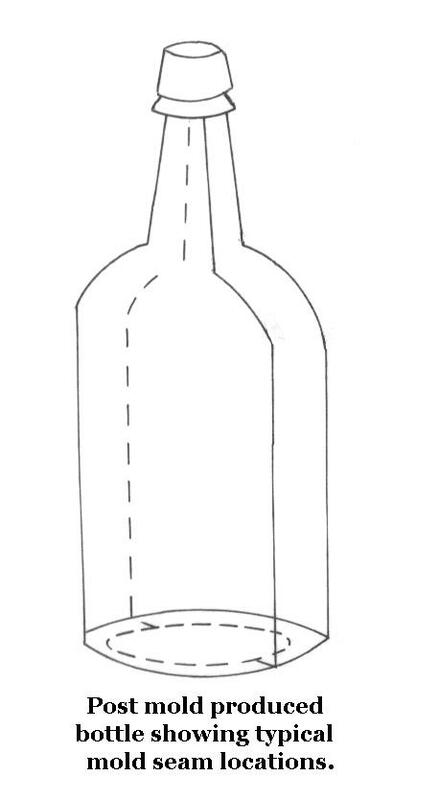 Simply put, this is the shape of the bottle base when viewed straight on and is usually the cross-section shape of the bottle body, though there are exceptions to the latter. For example, overall the three bottles in the picture at the top of the page are (from left to right) - octagonal, rectangular, and square. However, the rectangular and square bottles also have distinctly beveled edges and the octagonal bottle is actual round right at the heel of the bottle - all of which complicate describing the base profiles a bit. 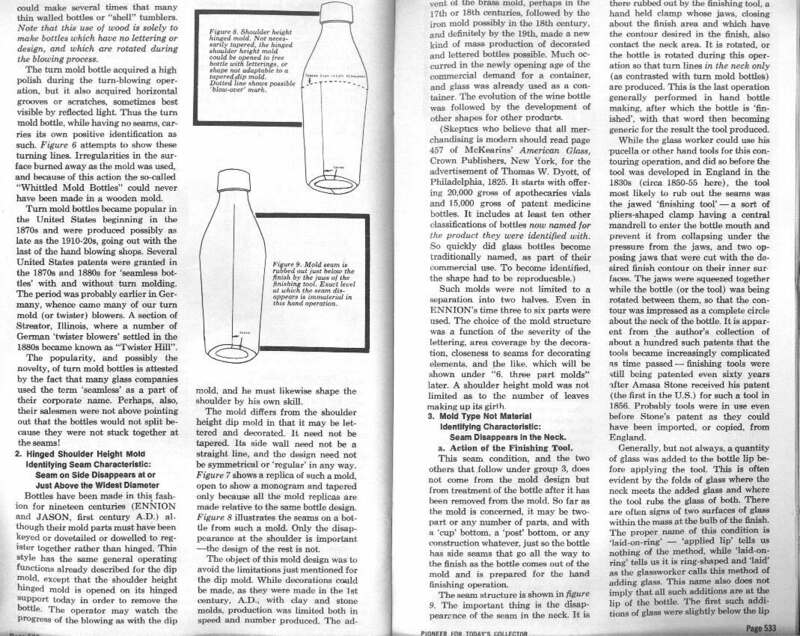 The best readily available source for classifying bottle base shapes/profiles is the "Bottle Base Profiles" illustration that was previously included in the IMACS (Intermountain Antiquities Computer System) guide. 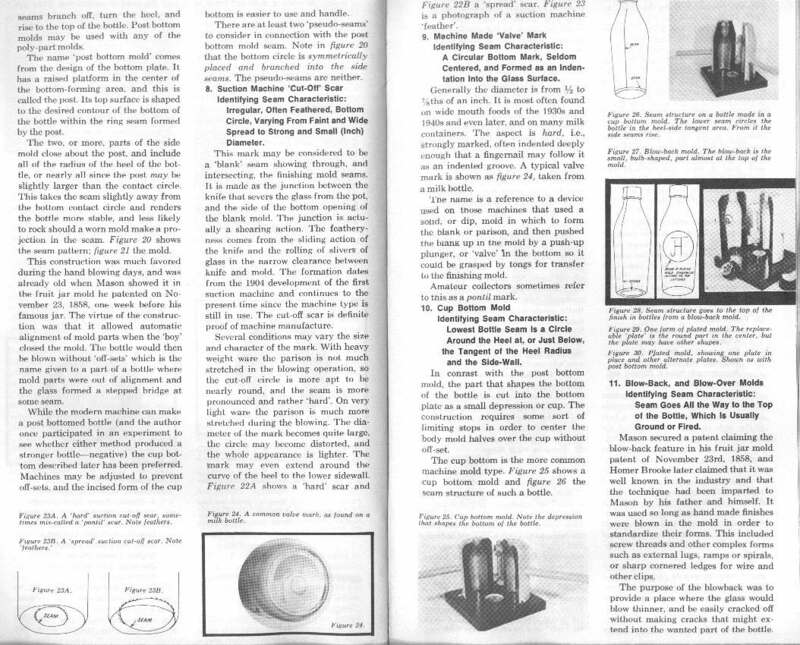 That guide is no longer available online through its long time host (University of Utah) although a copy of the entire bottle section is now (2015) available via this website at the following URL: http://www.sha.org/bottle/pdffiles/IMACSUsersGuide1992.pdf The base illustration by itself is available at the following link: http://www.sha.org/bottle/pdffiles/IMACSbaseprofiles.pdf This illustration was taken from Richard Fikes' excellent 1987 book (now again in print) on historic medicine bottles - The Bottle Book: A Guide to Historic Medicine Bottles. Consult the IMACS website above if interested in the nomenclature of describing base profiles. This Historic Bottle Website uses a combination of the IMACS names and intuitive shape names when describing base profiles. Markings or features on the base of a bottle are usually formed either by the mold or by a pontil rod (or punte)...or both. On machine-made bottles additional markings can be the product of the automated machinery which produce the bottle, but which are not part of the mold itself. Most significant here are markings related to the feeding of the glass to the mold - a subject covered later on this page in the "Machine-made bottles" section. Base Embossing: The bases of many bottles have embossing or symbols that pertain to the product that the bottle was designed to contain and/or the producer or bottler of the product. This type of embossing was engraved or "cut" into the mold at the request of the buyer ordering the specific bottle. Many other bottle bases have what are referred to as makers marks. 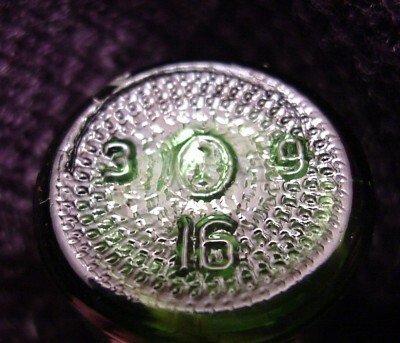 These are usually some type of embossed letters, symbols, and/or numbers which were molded onto the base of the bottle for a variety of glassmaker determined reasons. Click Owens-Illinois bottle base to view a picture of the relatively elaborate bottle base mold markings used by the Owens-Illinois Glass Company during the mid-20th century. Some markings indicate the glassmaker or manufacturer which produced the bottle; other markings were mold identification numbers or of unknown glass maker utility. 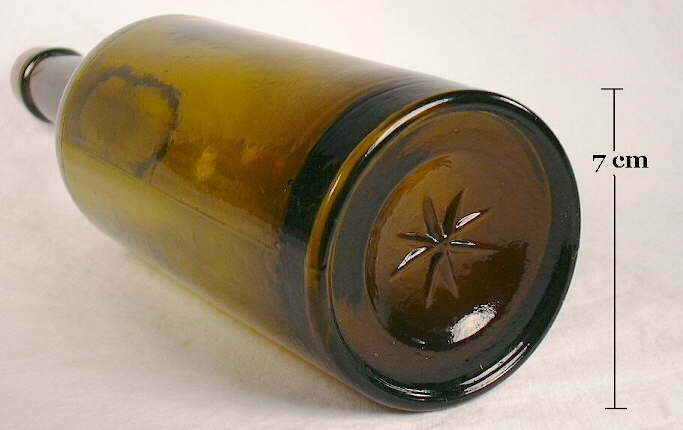 For example, the particular style of "star" on the base of the liquor bottle pictured to the left is widely acknowledged (in the collector world) to be a decorative marking of the San Francisco & Pacific Glass Works (SF&PGW - 1876-1902) since most of the bottles with this marking are either found in the West or are otherwise embossed with Western company and/or product names (Toulouse 1971; Zumwalt 1980). This commonly encountered symbol (at least in bottles found on Western historic sites) was intended either as a cryptic form of makers mark or simply an artistic flare of a specific mold cutter or engraver at the SF&PGW (or located in the Bay Area). Although the marking cannot be irrefutably attributed to SF&PGW, it presence is still a datable feature as empirical evidence indicate that bottles with this marking (primarily liquor and food bottles) date between the mid-1870s and about 1890. Currently, the best "one-source" work on the subject of makers marks is Dr. Julian Toulouse's 1971 book entitled Bottle Makers and Their Marks. Consult that book for more information. (Though long out of print there is a reprint available - click Bottle References for details.) 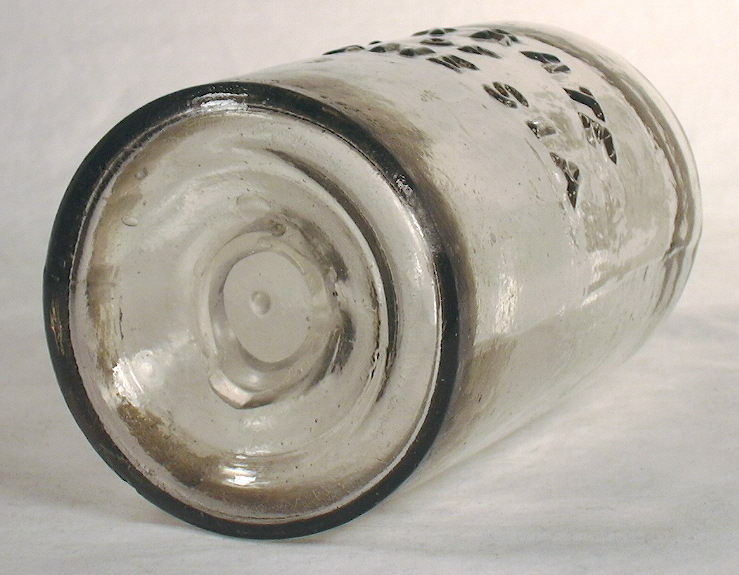 In addition, David Whitten maintains an exceptionally useful website of bottle (and insulator) makers marks at this link: http://myinsulators.com/glass-factories/bottlemarks.html. For more information on the subject of glassmaker markings see the Makers Marks page, which is a sub-page linked to the Glassmaking & Glassmakers page. This page is divided into two sections based on the primary methods by which bottles were manufactured - mouth-blown (hand-made) or machine-made (both semi and fully automatic) - since base features on these types of bottles generally differ significantly. There is also large section on pontil marks or scars located on a separate page due to its size (hyperlink found several places below). Short differentiating informational statements are provided below (in bold) to make an easy "break" between mouth-blown and machine-made bottles. For additional information, click Dating Page to go to the pertinent section of that describes the differences between these bottles. A. Mouth-blown bottles - Mouth-blown bottles have a side mold seam which terminates on the neck or within the finish (lip) below the top of the bottle; or less frequently, have no apparent side mold seams. Pontil marks or scars - This is the first section of this page and is found on a separate linked page. It covers the variety of marks/scars created by different empontilling methods: glass-tipped pontil scar, blowpipe pontil scar, sand pontil scar, bare iron pontil scar, and rarely a combination of several types. Free-blown bottle bases - Includes dip mold and pattern mold bases. This section also includes a discussion of push-up bases (aka "kick-up" base). Snap case - A discussion of the revolutionary tools that replaced the pontil rod in the mid-19th century (in a green box). Mold-blown bottle bases - Includes discussions on the primary mold types: three-piece molds, key & hinge molds, post-bottom molds, and cup-bottom molds. Bottle Type & Base Related Dating Observations - A overview of base related dating observations by bottle type (in a green box). Unusual or non-typical mold-blown bottle bases - Catchall for oddities and unusual items, i.e., rounded and turn-mold bases. B. Machine-made bottles - Machine-made bottles have a side mold seam which runs through the finish (lip) to the extreme upper edge - and usually over the edge - of the finish rim. Semi-automatic & automatic non-Owens machine bases - Discussion of the transitional bottle machines that bridged the gap between hand-made & machine-made processes. 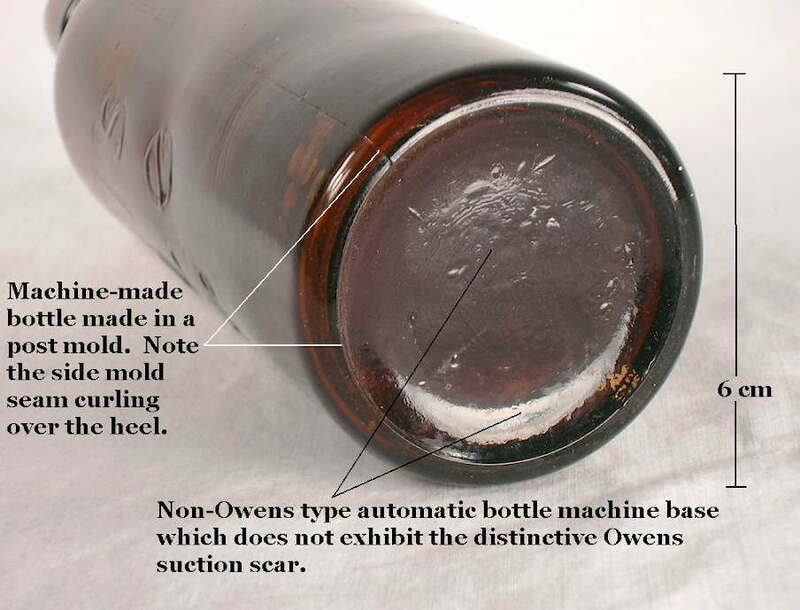 Owens machine suction scars - A discussion of the distinct scar on the base of bottles produced primarily by the Owens Automatic Bottle Machine. 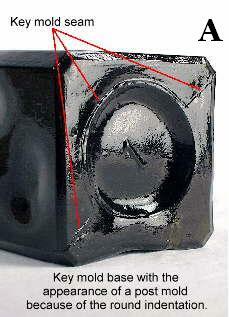 Valve or ejection marks - Discussion of a small round scar on certain types of machine-made bottle bases. 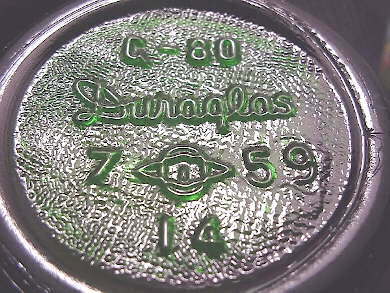 Stippling or Knurling - A discussion of this design feature found on machine-made bottles produced from 1940 to date. All mouth-blown bottles have in common the fact that they were blown with the force of a glassblowers lungs, not mechanically by machine. For a general overview of mouth-blown bottle characteristics and diagnostic features consult the page entitled Bottle Dating: Mouth-blown bottles portion of the Dating Key. 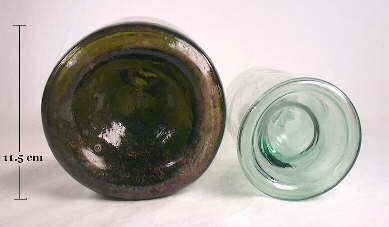 The bases of early (first half of the 19th century) mouth-blown bottles usually have some type of pontil mark or scar. 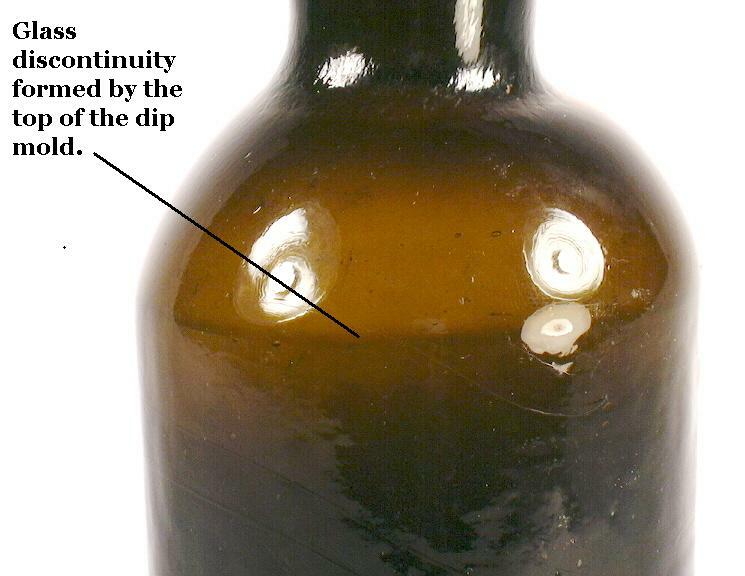 The presence (or absence) of pontil marks or scars and the specific type of mark, can be very useful in the dating of 19th century bottles. Pontil scars may be found on the bases of both free-blown and mold-blown bottles, both of which are covered on this page. If you are not familiar with the different types of pontil marks or scars, it is recommended that you review the associated webpage entitled PONTIL MARKS or SCARS. This page comprehensively covers all of the major types of pontil scars - how they were produced, what they look like, and some general dating information. Pictured here two examples of free-blown bottle bases which show variable amounts of non-uniformity and out-of-round conformation typical of free-blown bottles. Left: European Type 7 (McKearin & Wilson 1978) spirits bottle - ca. 1800 (Jones 1986). Right: French wine bottle dating from first half of the 19th century. Most of the above points also apply to the base of a free-blown bottle which will not be symmetrical (i.e., they are typically slightly out-of-round or otherwise distorted from the intended cross section shape), will have no embossing or mold seams, and will have flowing, generally simple lines. However, the glass at the heel or base edge of a free-blown bottle will tend to be somewhat thicker than the rest of the bottle which will be fairly evenly distributed (fifth "bullet" above). The base of free-blown bottles will almost always contain some type of pontil scar. When the base is looked at straight on there is almost always an appearance of the bottle body and base being out-of-round and non-symmetrical (picture above). Typically the heel and extreme lower body of a free-blown bottle flares out slightly with the base diameter being slightly wider than the average diameter of the bottle body. This was likely caused by a combination of the action of the tool that formed the push-up inside the base and the hot glass flowing or sagging as it was not kept contained by any mold surface (Jones 1983). This feature shows distinctly on the bottle pictured to the left (which is the same bottle on the right side of the picture above). 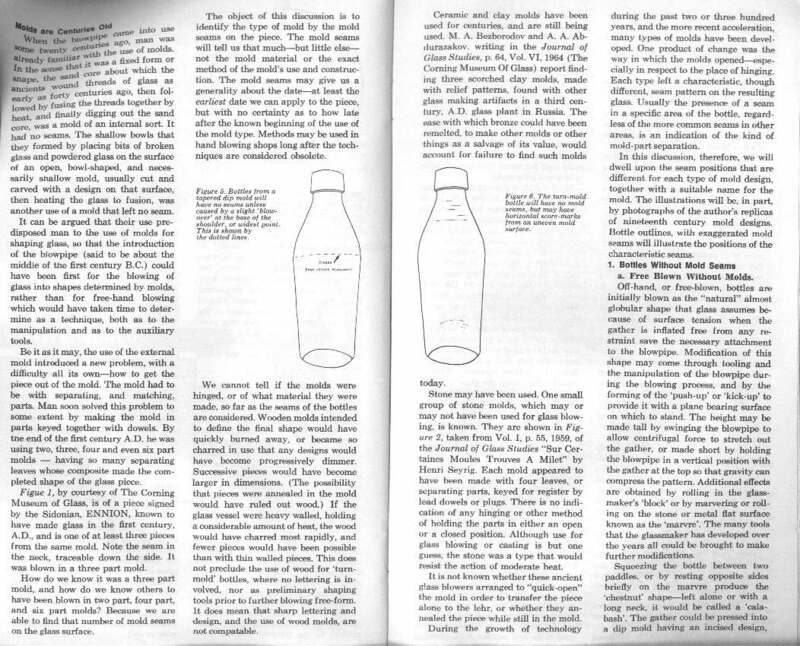 The picture to the above right shows the bases of two free-blown bottles which show varying degrees of non-symmetry. (Click free-blown bottles to view an image of these entire bottles.) The base to the left above exhibits some subtle out-of-round distortion and has a faint sand pontil. The bottle base to the right in the above image (same bottle to the left immediately above) shows much more variance from round though has no apparent pontil scar. This bottle does have an crude applied (laid-on ring) finish so it must have been held with some type tool in order to "finish" the bottle. The base shows obvious evidence of having been pushed up with an iron rod with a rounded though split or faceted end which left a distinct ball shape at the peak of the push-up with some impressions of the push-up rod (Jones 1971a). This bottle was likely empontilled but is an unusual example where no trace of residual glass or iron was left behind upon pontil rod detachment, though it is possible that the action of the push-up rod erased the pontil scar or the pontil and push-up rod were the same tool and simply left no iron behind. A common base feature of bottles of all ages is the indentation of the base upwards towards the top of the bottle. Base indentation is most common and pronounced on wine (image above left), champagne, and some spirits/liquor bottles but can be found to some degree in most classes or types of bottles since bottle bases are very rarely entirely flat. When the base indentation is shallow it is often described with terms like "indented" or "domed" - often with modifiers (e.g., slightly, moderately). When deep and distinct (like in the picture to the above left) the base indentation is referred to as a "push-up" or "kick-up"; the latter term being the most common term with collectors (Jones & Sullivan 1989). Push-ups were also called a "shove-up" by some early glass makers (Illinois Glass Co. 1908). The push-up is also referred to as a "punt" in some quarters (Wikipedia). 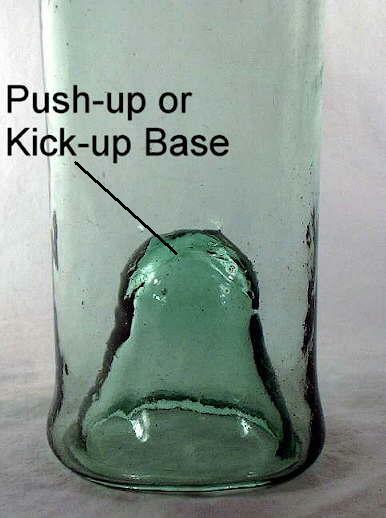 The term push-up comes from the early days of glass blowing where this base indentation was actually formed by physically pushing upwards in the center of the base with some type of tool while the bottle was still hot and plastic. This was the only way to accomplish this feature with free-blown bottles and was done with tools that were sharp, cone shaped, rounded, blunt, or even multi-part ("quatrefoil"). Different tools left different evidence of their conformation, as noted for the aqua bottle pictured above left which was "pushed-up" with a rod with a ball shaped head. Often these tools were used as pontil rods leaving behind distinct markings indicating the shape of the rod head. On many earlier black glass spirits, wine and beer bottles the use of these tools - which probably had the business end heated up in the furnace so as to not crack the bottle when used - caused a variably distinct bluish cast to the upper portion of the push-up (empirical observations). With the use of molds for forming bottles, the indentation was usually formed by the molds base plate (Jones 1971a, 1986; Boow 1991). The dip mold is a step up from simple hand tool manipulated free-blowing in the manufacture of bottles. A dip mold is a cursory open top mold that was used to gain uniformity and consistency (and likely increased production) in the shaping of bottle body and sometimes base. 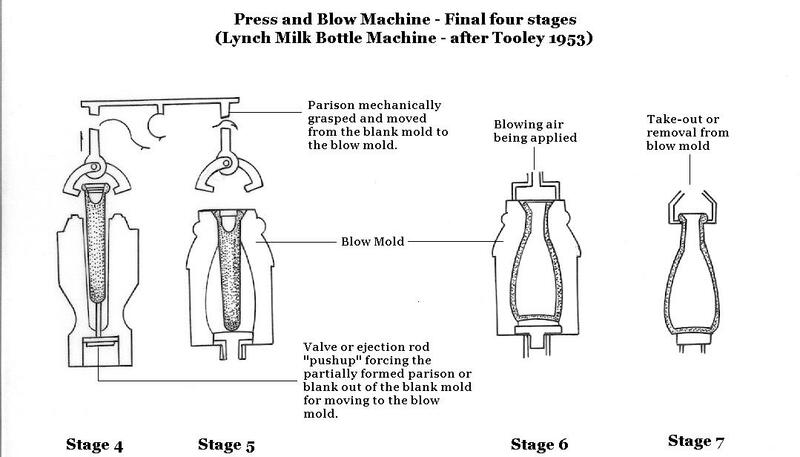 A simple one-piece dip mold is illustrated to the right showing its open top and the slight narrowing taper from top to bottom which allowed for removal of the inflated bottle (Jones 1986). 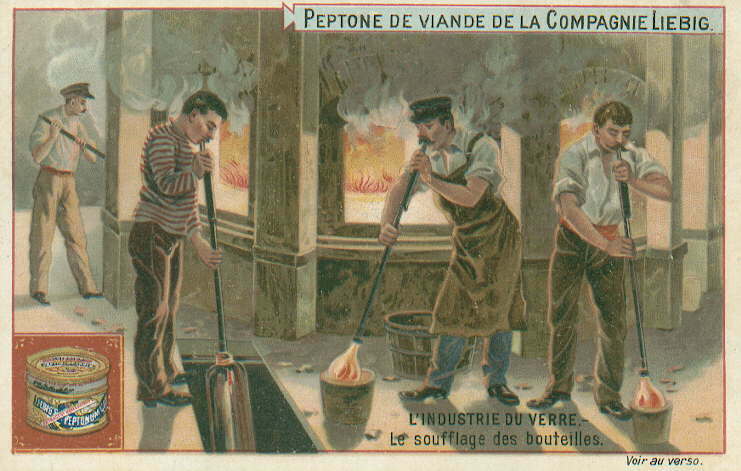 Click glassblowers at work to view a late 19th century illustration of glassblowers (middle & right) using dip molds, that look like (and maybe are) buckets, to help form their bottles. Some dip molds were simply appropriately shaped holes in the floor of the glass works (Kendrick 1968). One-piece dip molds leave no distinct mold seams on the body or base of the bottle. 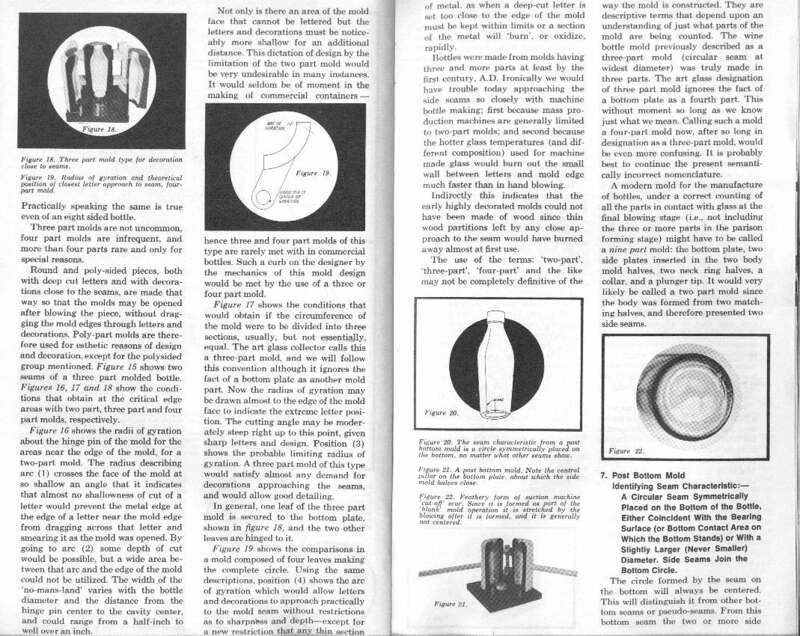 According to Jones (1986), a dip mold could be made of multiple pieces but they did not open and shut. Two (or more) piece, shoulder height dip molds could leave vertical seams on the body of the bottle, but are very uncommon; the author of this website has never seen or heard of a U.S. bottle produced this way (though it likely occurred). The majority of dip molds appear to have been either one piece or had a one piece body with a separate base plate. Dip molds were made of a variety of materials including wood and harder materials like metal, clay, and clay lined wood. Wooden dip molds (a common early molding material) had to be kept very wet in order to survive long the intense heat of molten glass. This allowed steam to form in between the hot glass and mold surface causing the glass to "ride" on the steam cushion making the evidence of molding often very difficult to distinguish from free-blown bottles. 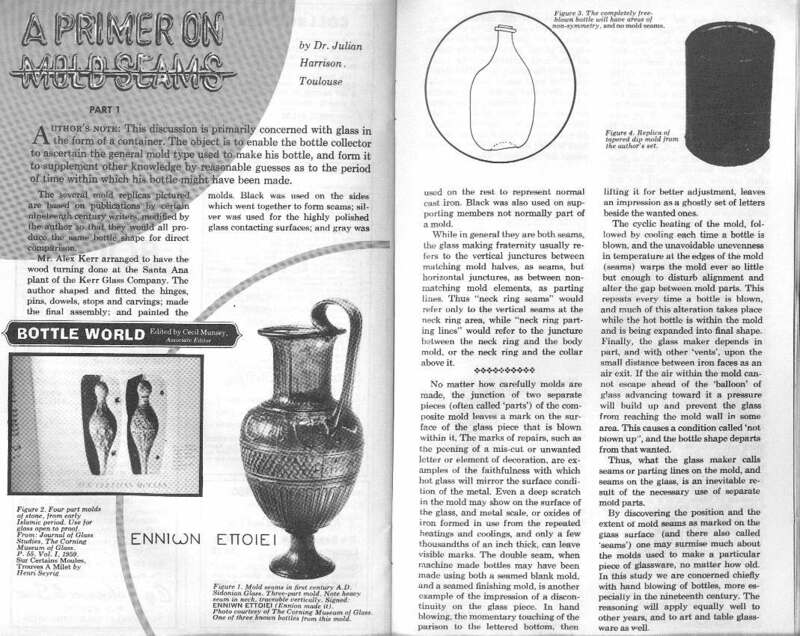 Dip molds were used for glass manufacture back to antiquity, long before the era covered by this website (Toulouse 1969b, Jones 1986, Jones & Sullivan 1989, Deiss pers. comm. 2005). The base of a dip mold bottle will be very similar in appearance to a free-blown bottle except that it will tend to be more symmetrical in shape with little or no out-of-round distortion. However, this is often hard to ascertain and the best way to tell a dip molded bottle from a similar free-blown bottle is to look at the body and shoulder. Dip molded bottles will have a distinct discontinuity in the glass appearance right at the break between the the body and shoulder. This is shown distinctly in the picture at the following link - dip mold bottle shoulder. This is a dip molded ale or liquor bottle that dates from the 1850s. 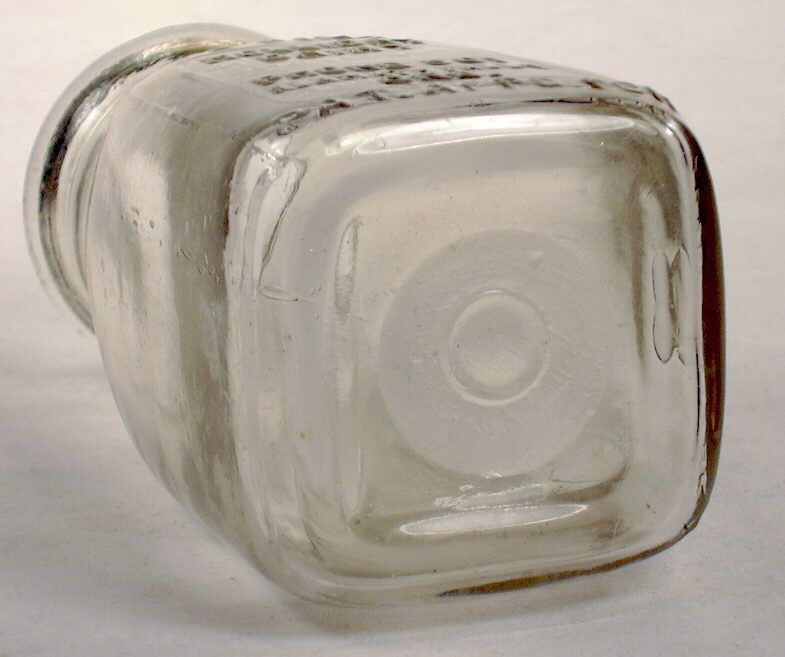 Dip molded bottles may also have embossing on the base as shown in the picture above which is a mid-19th century case gin bottle produced in a dip mold. The absence of mold seams (and embossing) on the bottles sides/shoulder but with embossing on the base is a fairly certain sign that the bottle is from a dip mold, or even more rarely, a turn or paste mold (discussed later on this page). Dip molds were most commonly used during the first half of the 19th century (and before) with little use after the early 1870s (Wilson & Wilson 1968, Jones 1986). 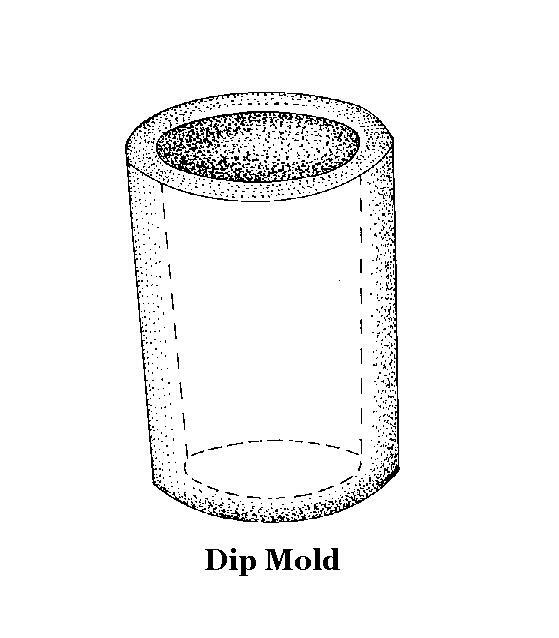 Dip molds are also covered in more depth on the Bottle Body Characteristics & Mold Seams page. Any mold can have a pattern inscribed or cut into its surface. As used here the term pattern mold is a variation of the dip mold in which a pattern was inscribed on the inside surface of the dip mold. 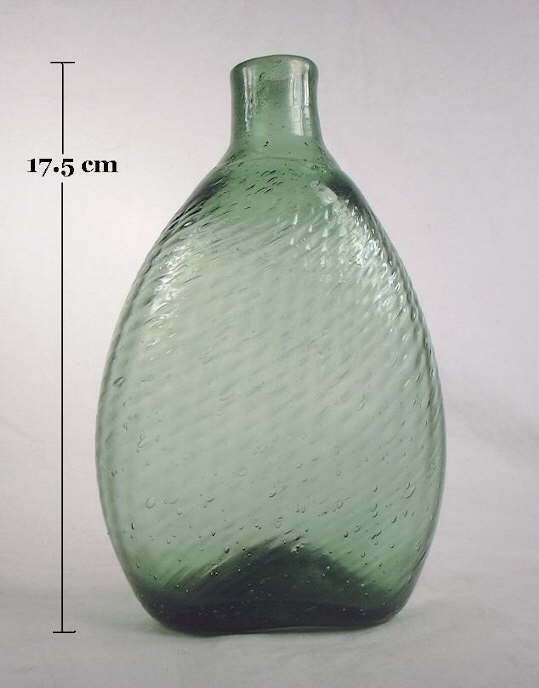 With bottles the pattern was typically vertical lines or ribs which resulted in a ribbed pattern on the glass surface. 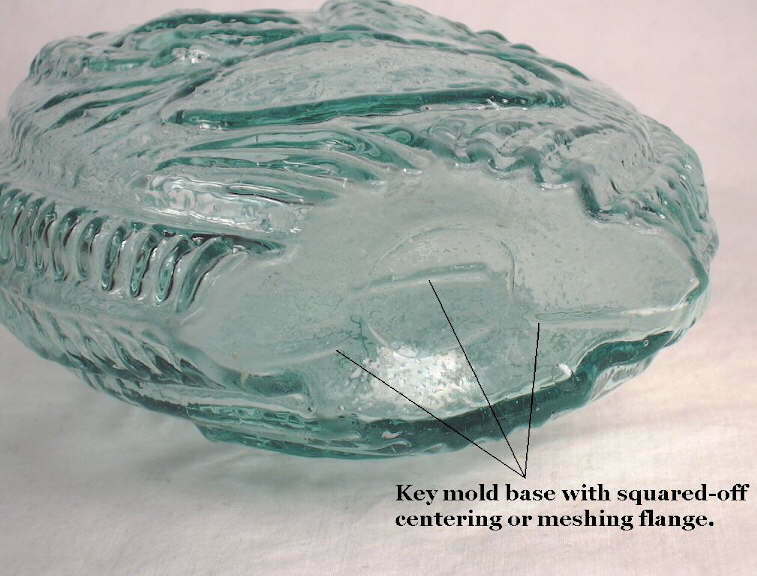 Pattern molds were often smaller than the bottle itself since the mold was typically used only to impress a pattern on the glass surface not to actually delineate the form of the bottle base and body. Once removed from the mold the bottle continued to be blown and expanded to reach the desired size (Munsey 1970). Pattern molding was more common with glassware than with bottles but is common enough to warrant mention here (Jones & Sullivan 1989). Pattern molded bottles will usually have the pattern from the mold continuing from the sides "seamlessly" around the heel and onto the base (Kendrick 1968). The pattern molded bottle pictured to the left is a "Pitkin" style flask that was likely made at a New England glassworks between 1780 and 1820 (McKearin & Wilson 1978). Click the image to view the larger version which shows the pattern mold line impressions continuing around the heel of the bottle into the base. This bottle also has a glass tipped pontil scar. The final formation of the base was done by hand tools after the bottle was removed from the pattern mold, so these bottles are really a variation of a free-blown method described earlier. Click Pitkin flask to view a picture of the entire flask which shows the mold pattern on the body of the bottle. These flasks were double patterned molded in a process that is known as the German half-post method which results in the appearance of both vertical and diagonal lines on the body. This is an unusual color for a New England style "Pitkin" as most were blown in darker shades of green (e.g., olive green, olive amber) instead of the lighter clear green this flask exhibits. Click olive Pitkin flask for a picture of an olive green "Pitkin" flask (Noordsy 2003). 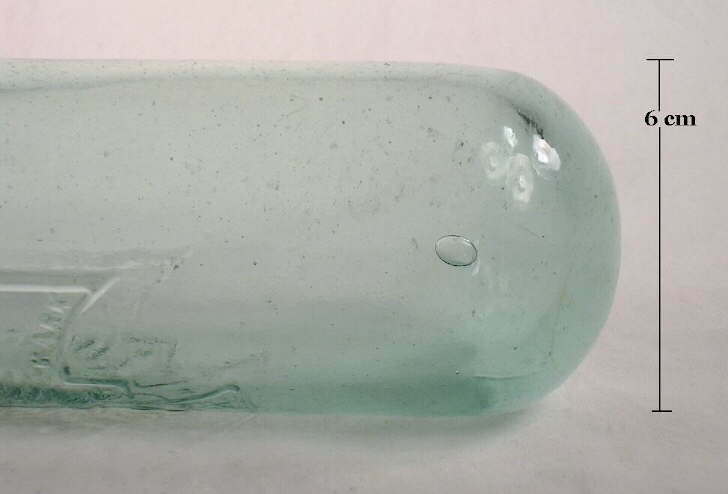 Most free-blown, dip, and pattern molded bottles were blown during the era when empontilling was the primary method for holding the bottle during finishing, i.e., prior to about 1860. As discussed on the previously noted Pontil Marks or Scars page, pontil rods were gradually replaced from the early to mid 1850s through at least the mid-1860s by non-bottle scarring tools which are covered next: the snap case and similar sabot (McDougall 1990). Instead of affixing a pontil rod in some fashion to the base of the hot, post molded bottle (as described above) the handler (or servitor) used one of these non-empontilling tools to hold the bottle. These tools usually left little or no markings on the bottle base or sides. Sometimes a bottle will appear to have the surface texture of the body sides indented or roughed up by the tool or the sides slightly flattened by over-compression. It is usually difficult or impossible to conclusively differentiate the subtle markings of a snap-case or sabot from the array of possible mouth-blown mold or glass making imperfections. The sabot (also called a "spring cradle") was the earliest version of a non-empontilling (i.e., non-bottle scarring) bottle holding tool and was developed in Europe possibly as early as the 1697, though probably not much used until the early 19th century (McKearin & Wilson 1978, Van den Bossche 2001). This four-pronged tool was sized to closely fit the diameter of the base and lower sides of the bottle with different sized sabots apparently necessary for different diameter bottles. The sabot likely made its way to the U.S. by the early 1850s (Toulouse 1968; McDougall 1990). 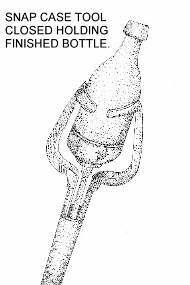 An illustration of the sabot can be found in the book Antique Glass Bottles - Their History and Evolution (1500-1850) by Willy Van de Bossche (2001) which is still widely available. 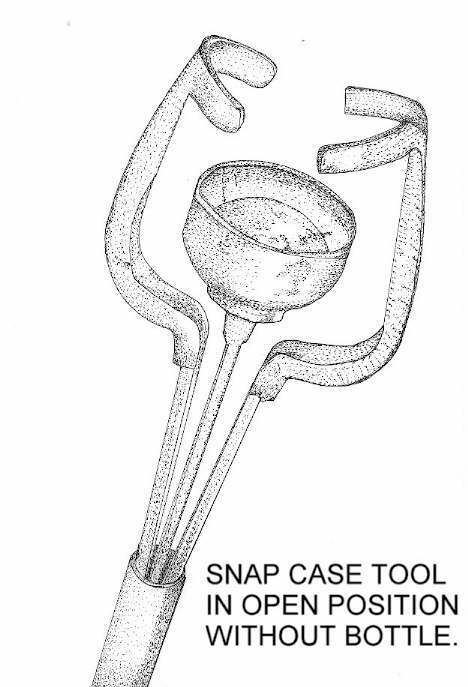 However, the sabot was likely quickly replaced by the more versatile and easy to use snap-case tool which could hold different diameter bottles due to moveable or interchangeable parts (McKearin & Wilson 1978; Deiss pers. comm. 2005). An 1884 patent granted to Joseph B. Wilson for a "Clamp for Holding Bottles" is available by clicking Patent No. 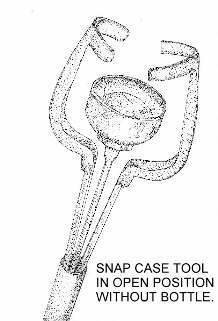 294,946 which illustrates one version of an adjustable snap-case tool and a description of how it worked (U. S. Patent Office 1884a). 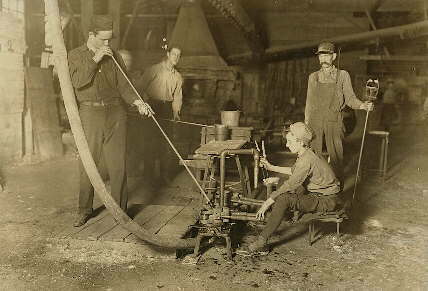 The 1908 image to the right was taken at a West Virginia glass factory and shows a "gaffer" (blower) at work to the far left of the photo with his crew. This is a typical mouth-blown shop crew which included the "mold tender" boy (lower right) with a set of "tongs" in his right hand, the "gatherer" (behind gaffer) with the next gob of glass for the gaffer on a second blowpipe, and the "snapper up" (to the right standing) with a snap-case tool in his left hand. The caption to the photo is: "Glass Blower and Mold Boy. Boy has 4 1/2 hours of this at a stretch, then an hour's rest and 4 1/2 more: cramped position. Day shift one week: night shift next. Grafton, W. Va. Location: Grafton, West Virginia" (Lewis Hine photo, Library of Congress). The majority of American bottles produced from 1810-1815 on were made in some type of more or less full length contact mold, i.e., a mold which formed the entire bottle except possibly for the finish and upper neck. The exception to this timeline is that cheap, round, utilitarian ware like dark green wine, ale, and liquor bottles continued to be made by free-blown and dip molded methods up until about 1870 though in rapidly diminishing quantity after mid-century (Jones & Sullivan 1989). See the Glassmaking & Glassmakers page for more non-base related information on glassmaking and molds. 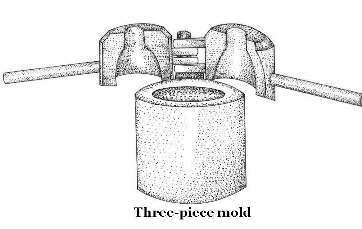 One of the earliest mold types to be used in the U.S. was the "three-piece mold." This mold type was likely first used in about 1814 in England, patented by Henry Ricketts (Bristol, England) in 1821 or 1822, and likely adapted into the U.S. by the 1830s (McKearin & Wilson 1978; Jones 1983; Hume 1991). (The picture to the left is of a very early Ricketts' bottle with the base - with a sand pontil scar - pictured to the right.) 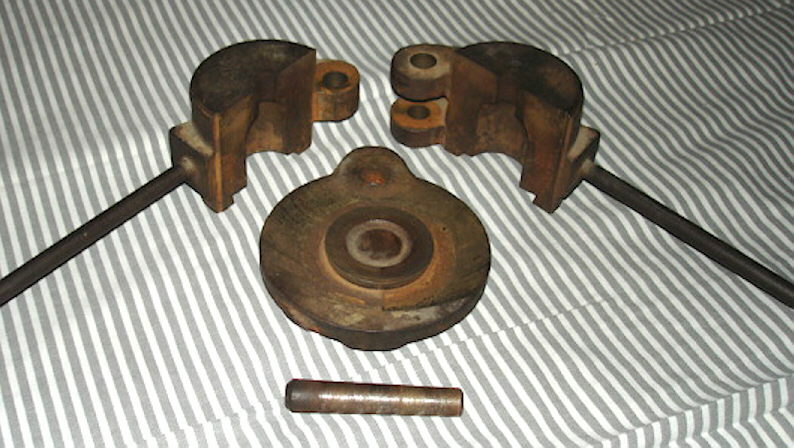 Although earlier versions of a three-piece type mold may pre-date the Rickett's mold it is not certain. If so, they would have been essentially a dip mold with two shoulder mold sections added. (See illustration to the right below.) 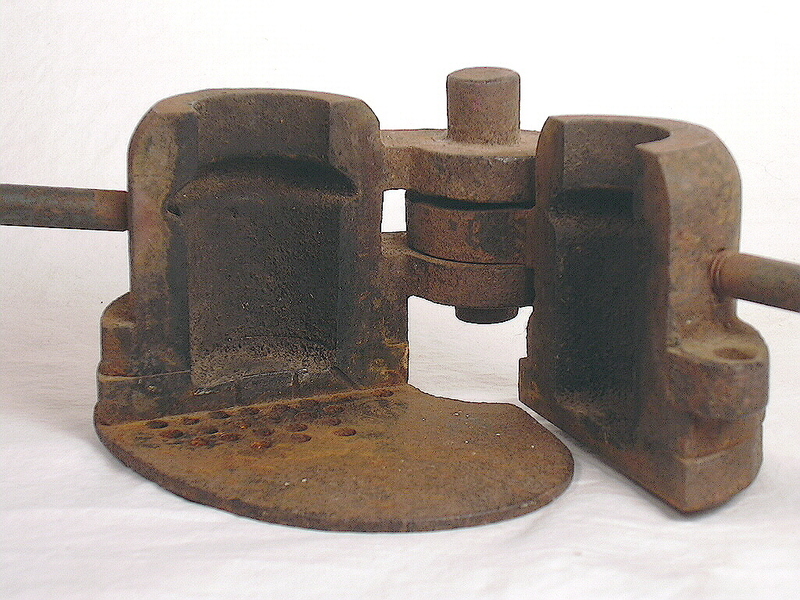 Rickett's patent added several other features, including hinged shoulder parts and foot controls for opening and closing the mold, both of which were significant improvements in efficiency. The Rickett's mold consisted of at least five parts - two opposing shoulder parts, dip mold body portion, and a removable base plate (with two parts - a center post part with a washer like ring around it) which could be changed to achieve different base configurations and/or for different embossing. This mold type was likely the first plate mold - via the removable "washer" type ring around the center post - that allowed for the easy changing of the base embossing. 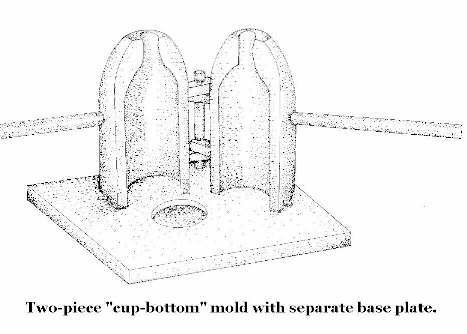 The center post portion of the base plate also formed a moderate depth push-up that is typical of Ricketts type mold formed bottles, eliminating the need for a separate step in the bottle making process to form this common period base feature (McKearin & Wilson 1978; Jones 1983; Boow 1991). Many or most actual Ricketts' produced bottles are embossed on the base with H. RICKETTS & CO. GLASS WORKS BRISTOL, date between 1821 and 1853, and almost always have a sand pontil scar (Jones 1983; Boow 1991). 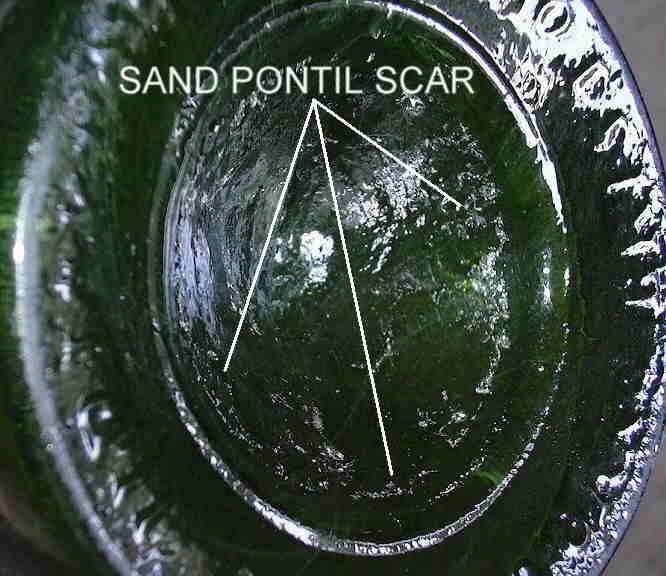 The base of the pictured early (seal dated 1822) Rickett's bottle is discussed under the discussion of the "sand pontil scar" on the related Pontil Marks or Scars page. The mold seam for the center post is visible in the picture to the above right as the circle just inside the base embossing and just outside of the sand pontil scar. Morphologically, three-piece mold bottles have a horizontal mold seam encircling the bottle where the shoulder and body meet and two mold seams on opposite sides running vertically from the shoulder seam, up the shoulder, and variably up the neck and/or finish. 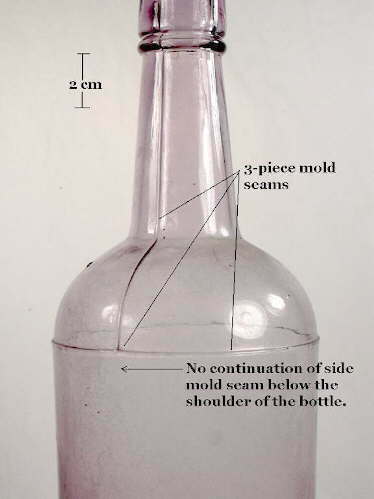 Click on the small picture to the right to view a close-up of the mold seams on the shoulder and neck of this late (1900-1910) mouth-blown, three-piece mold liquor bottle. Some neck seams disappear right above the junction of the shoulder and neck, particularly on the earlier Ricketts' bottles which were not molded above the shoulder (neck formed with post molding tools). Later side mold seams end immediately below the base of the applied finish (1830s-1880s), and the latest three-piece mold bottles (1890s into the early 20th century) may have side mold seams ending within the improved tooled finish, like the bottle pictured to the right if one looks closely. 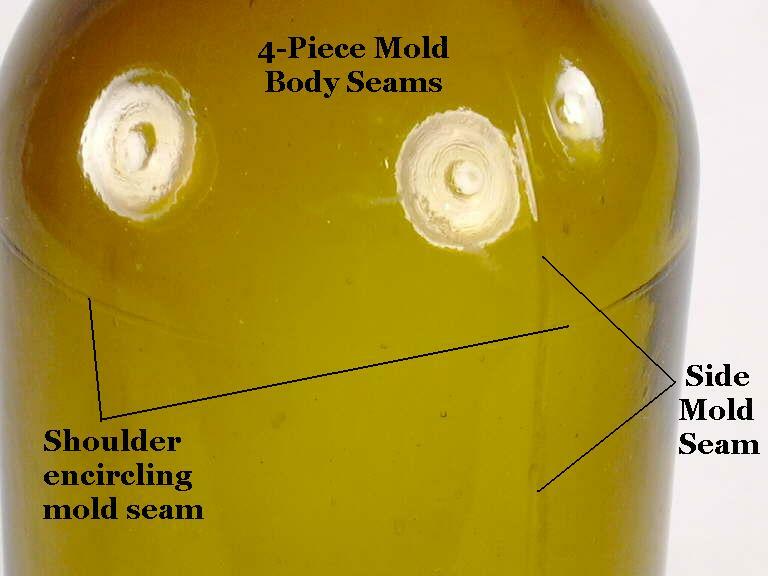 Three-piece mold bottles are not embossed on the body of the bottle, though may have embossing on the shoulder (fairly common), neck (unusual), and/or base (very common). Most bottles which are commonly referred to as three-piece molds were actually made in a mold that had at least a fourth base plate piece, like already noted for the Ricketts' patent mold bottles. The bottle pictured to the left also had a separate base plate even though the bottle is largely unembossed (there are mold numbers very faintly embossed on the base). Click three-piece mold base to view a close-up picture of the base showing the base plate seam ridge (mold numbers not visible). Use of a separate base piece undoubtedly made construction of the mold easier. Although most three-piece mold bottles actually had four mold parts, referring to them as "three-piece" molds will certainly continue due to its ubiquitous use over the years. To suggest changing the name would be confusing and unproductive since most people understand what is being referred to (Toulouse 1969b). What is called the four-piece mold is a variation of the three-piece mold with two body halves; it is discussed in the box below. 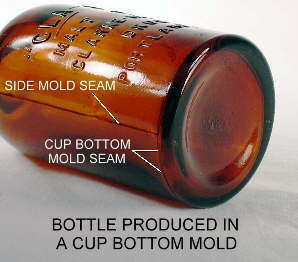 The bases of later three-piece molded bottles typically do not exhibit any mold seams within the confines of the base like are found on the key/hinge and post-molds (covered below) with the exception of the often vague post plate induced seam noted above for bottles produced in Ricketts type molds. If a three-piece molded bottle was made in a mold with a separate one part base plate, it may have a visible mold seam encircling the heel of the bottle exactly like the cup-bottom mold will produce. These type of three-piece molded bottle bases are largely indistinguishable from cup-bottom mold bases if one only has the base and none of the body to look at (and could actually be considered a type of cup-bottom mold). cup-bottom mold produced bottles are distinguished, of course, by having vertical mold seams on the body below the shoulder; three-piece mold bottles do not. Since three-piece mold bottles were made for almost a century (1821 through the 1910s) other diagnostic features unrelated to the molding of the base must be used to narrow the dating range. The term four-piece mold refers to a mold that has four main body parts - two for the shoulder and neck (and sometimes extreme upper body) and two for the majority (or all) of the body. Four-piece molded bottles are very similar to the three-piece molded bottles in that there is a horizontal seam on or just below the shoulder with the side mold seams running vertically up the shoulder and neck from this horizontal seam. However, four-piece mold bottles also have vertical body side mold seams which runs down from the shoulder seam to at least the heel of the bottle. The picture to the left shows these features. Click star base liquor bottle to see a picture of this entire bottle which dates from the late 1870s to mid 1880s and was likely produced by the San Francisco & Pacific Glass Works. Virtually all four-piece molds also had a fifth base plate portion which could have the conformation of either a "post" or a "cup." Review the descriptions for the post-bottom and cup-bottom mold produced bases below since the base of a four-piece mold utilizing either base plate type is indistinguishable from two-piece molds with the same base type. The utility of four mold sections was to allow for the changing of various portions to either add embossing to the body of the bottle (this type mold was called a "sectional plate mold" for that reason) or to even change the capacity of the bottle without the need for creating an entirely new mold (Elliot & Gould 1988). 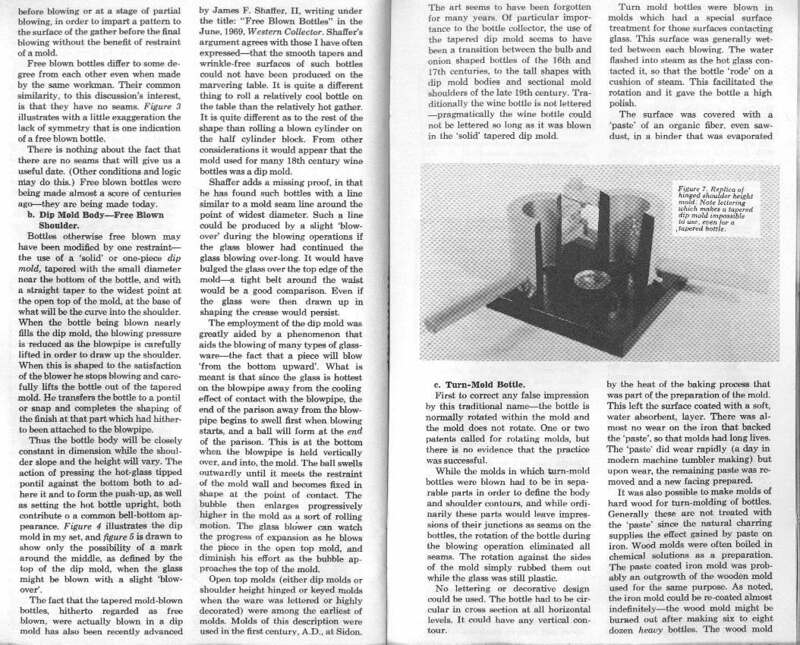 After the dip mold, the simple or "true" two-piece mold (typically hinged or fitted) is probably the oldest of the mold types dating back to at least the first century A.D. (Munsey 1970). These molds could be shoulder height or full-height (like the illustration to the left) and typically did not include any of the finish conformation structure, unless the finish was a simple straight (sheared/cracked-off) finish which is basically just the upper end of the neck. The full-height two-piece mold was in use for making bottles in the U.S. by 1809 as at least one embossed medicine bottle with a well established date of manufacture is known to have been molded this way (Toulouse 1969b; McKearin 1970). By the late 1810s and early 1820s, two-piece molds were commonly being used for figured flasks, medicine bottles, and other items although free-blown manufacture and dip molds were still commonly used until about the Civil War (McKearin & Wilson 1978). Most types of molded bottles are frequently referred to by collectors and archaeologists as having been produced in "two-piece" molds even though the mold was likely composed of more than two separate mold sections (covered later on this page). The point being made by users of the term is that the body, shoulder, neck, and sometimes the base (as covered in this section) were molded by the two large and opposite sections of the mold. Though not always totally accurate it is a reference that is unlikely to go away because of its pervasive use. In fact many modern bottles were and are produced in molds that technically have up to nine different parts, but are still frequently referred to as having been produced in a two-piece mold (Toulouse 1969b). The true two-piece "hinge mold" came in several different configurations which all had in common that there were truly only two molding sections to the mold, as illustrated above. 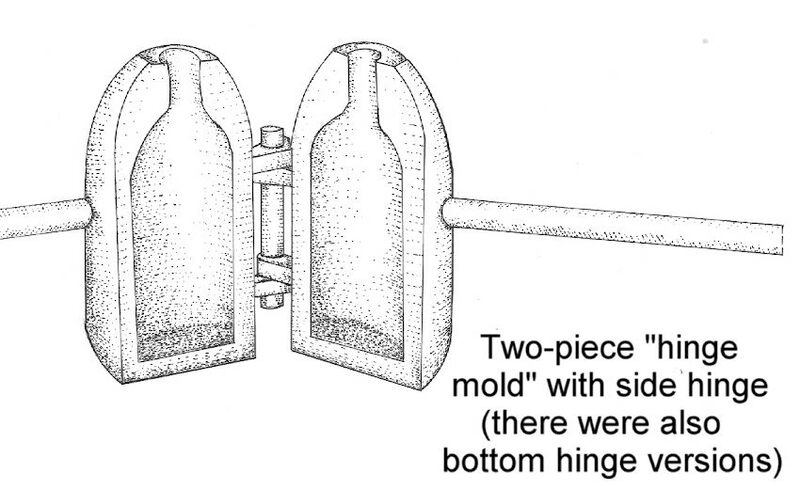 The classic two-piece hinge mold, which began at least as early as 1810 in the U. S., produces a bottle with a base that was equally formed by each half of the hinge mold, i.e., the base mold seam splits the base into two equal and symmetrical portions (McKearin & Wilson 1978). This conformation is illustrated by several images and illustrations in this section including the 1850s-1860s era "spice" bottle to the left which shows this type base seam, in this case underneath a blowpipe type pontil scar. The base also has an embossed "star" inside of the pontil scar that overlaps both mold halves. (Illustration courtesy of California State Parks.) 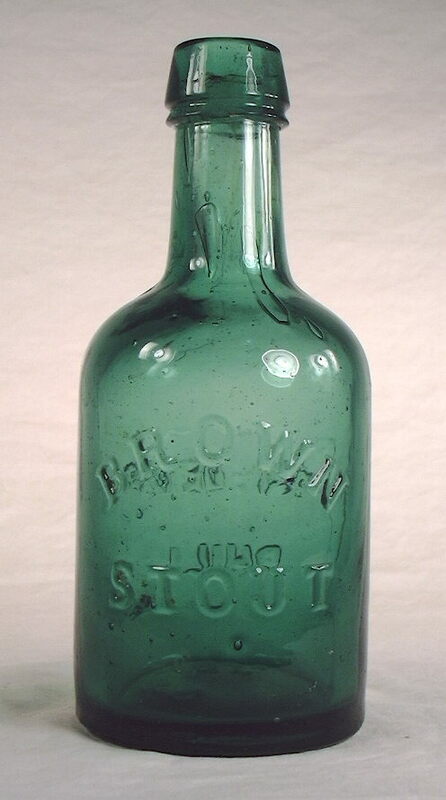 Another example is the 1860s Philadelphia, PA. "brown stout" bottle pictured to the above right which has a distinct, thick mold seam equally splitting the base - an unusual conformation for this style bottle (entire bottle illustrated at the link: brown stout bottle). The flask pictured to the right below is also of this conformation with the mold seam symmetrically dissecting the base. Bottles produced in a simple two-piece mold with no separate base part have a mold seam which bisects the entire base. 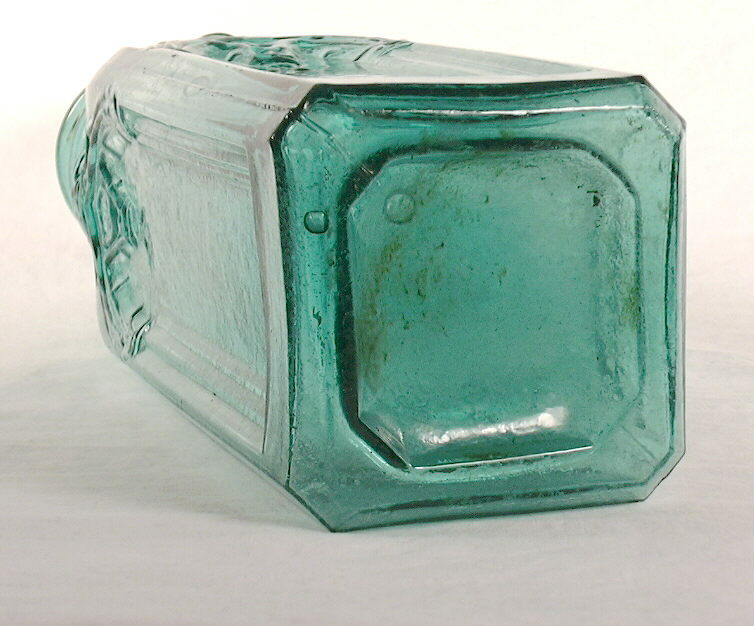 These are often referred to as "hinge mold" or "snap case" bottles. Bottle pictured is a Washington-Taylor figured flask (Philadelphia, PA.) - ca. 1860-1870. These symmetrical true two-piece molds could be either hinged on the side - as illustrated above (actual side hinged mold image available at CLICK HERE) - or hinged on the bottom so that the mold opened like a waffle iron (Toulouse 1969b; Boow 1991; Russell 1998). Although the location of the hinges (bottom or side) left no trace on the bottles themselves, side hinged two-piece molds (like illustrated above right) could only produce bottles without any (or very little) molded indentation to the base, i.e., with a flat base like the bottle base pictured to the right. Otherwise the mold would not open properly once a bottle was blown in it. (It should be noted that many true two-piece molded bottles with pontil scars - like the "spice" bottle to the above left - have slightly indented bases which are often the result of the pontil rod pushing the flat - still plastic - base inwards to help the bottle stand upright more easily with the protruding pontil scar and not necessarily due to being molded that way.) True two-piece molds with molded indented bases (i.e., the indentation is obviously molded not pushed in by the pontil rod) had to have been base hinged since the mold would not open properly with side hinges. One disadvantage of this general mold conformation was that the location of the base mold seam often contributed to bottle instability if the mold seam protruded much, which was a frequent occurrence with the poor mold surface meshing of early to mid-19th century molds. The deep aqua flask pictured to the above right was blown in a mold similar to the illustration above with the base formed in equal halves by each side of the mold. The terms hinge mold base or snap case base are used by many to denote this configuration of the true-two piece mold (although in the case of the spice bottle illustrated to the left, a pontil rod was used to hold the bottle for finishing, not a snap case tool). 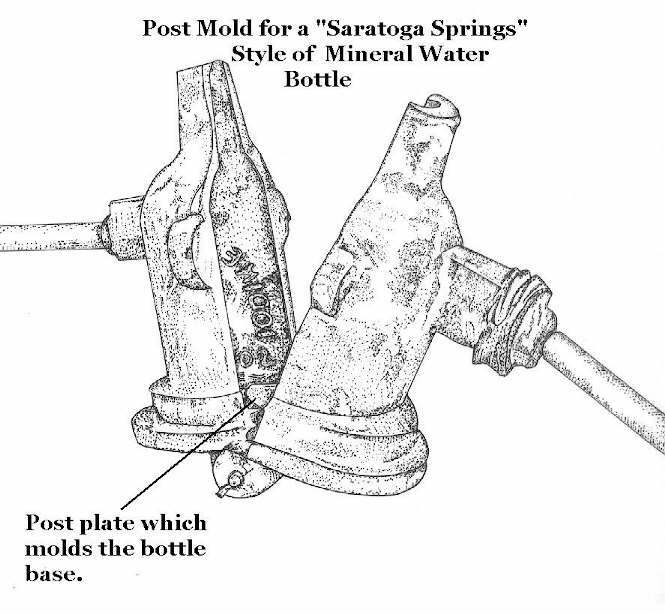 Though these terms are nominally accurate - the bottles were produced in a hinge mold and a snap case tool was used - these terms or methods also pertain to virtually all mouth-blown bottles since most all molds were likely hinged and some type of snap case tool held all molded bottles that were not empontilled. Key mold base with the deceptive appearance of a post base mold. Dr. Hostetter's / Stomach Bitters (Pittsburg, PA.) - ca. 1865-1870 (Wilson & Wilson 1969). 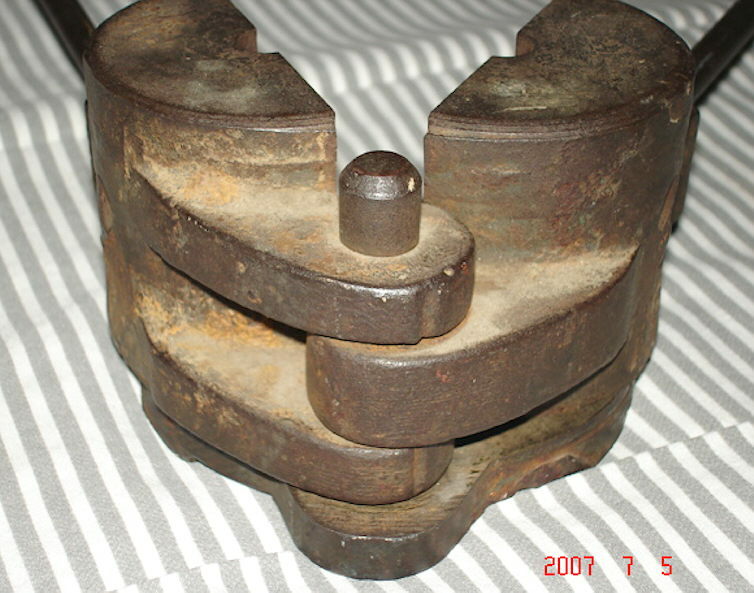 Another configuration of the true two-piece mold, which varied from the mold illustrated above, were molds in which the two halves of the base - as defined by the still continuous though not straight base seam - were not equal in size. As shown in the picture to the left (Dr. Hostetter's / Stomach Bitters) the entire depression area in the center of the base and bottom and right outer base edges were formed by a "flange" protruding from one mold half. The remaining outer perimeter area of the base (left and top portions of base in the image), outside of the depression area, was part of the other mold half which surrounded and accepted the "flange" from the other mold half when the mold halves were pressed closed. Other variations of the keyed mold type have a much less pronounced arching of the one side of the base mold portion into the other side or have a squared off "notch" that has abrupt right angles instead of rounded arching. Click key mold base to view a picture of a ca. 1865-1875 patent medicine bottle with a more subtle rounded key mold base without a base center depression. Click notched base to view a picture of an early American (1840s) pint liquor flask (Pittsburgh, PA.) that exhibits the abruptly "notched" or squared-off keyed base flange on the base. All these variations served the same function of centering the mold halves better as the mold was swung shut. 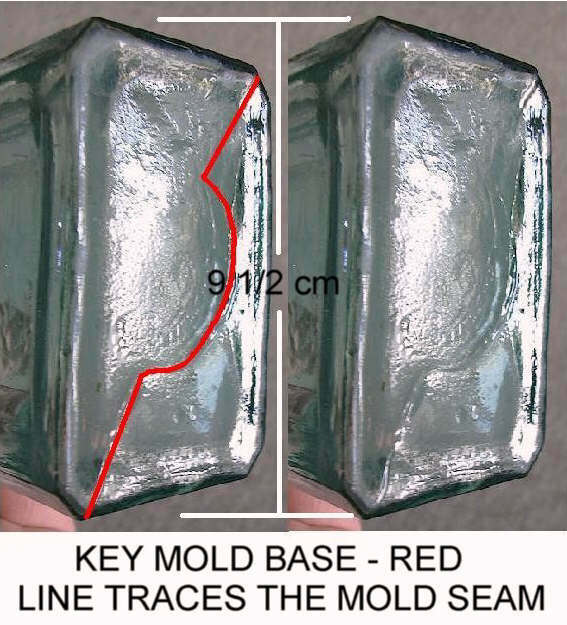 Both basic styles of true two-piece mold bottles (straight ["hinged"] and non-straight ["keyed"] continuous base mold seams) can be found with any of the four types of pontil scars overlaying the base mold seam, though the sand pontil is uncommonly seen on keyed bases. Pontil scars would provide date bracketing opportunities as discussed on the Pontil Scars page, i.e., these bottles would very likely date between about 1810 and the early 1860s. All styles of true two-piece mold bottles largely disappeared by the mid-1870s allowing for a reliable dating end point for non-pontiled, hinge/keyed base bottles, although a few hinge mold base liquor flasks made by Louisville, KY. glass companies - and known to date from the early 1880s - have been observed by the author (Toulouse 1969b; Berge 1980; Jones & Sullivan 1989; empirical observations). The one significant exception to this dating is that round bottom or torpedo soda bottles continued to be produced in true two-piece molds until the early 20th century. Hinge mold bases can date back to at least 1810 in the U. S., but keyed bases appear to have originated in the late 1840s or 1850 allowing for a relatively reliable begin date for this type of base (Toulouse 1969b; McKearin & Wilson 1978). These base types can be found on virtually any type or class of molded bottles produced between 1810 and the mid-1870s; one study (Farnsworth & Walthall 2011) found that with Illinois bottles the keyed base molds ceased being used about 1871. Thus, there appears to be no bottle type specific dating significance to the use of a hinge or keyed mold, like the post-bottom and cup-bottom molded bottles discussed next. The date or origin of this style of mold is unknown, though it was used in the U.S. at least as early as the 1840s and as late as the early 1900s for mouth-blown bottles. 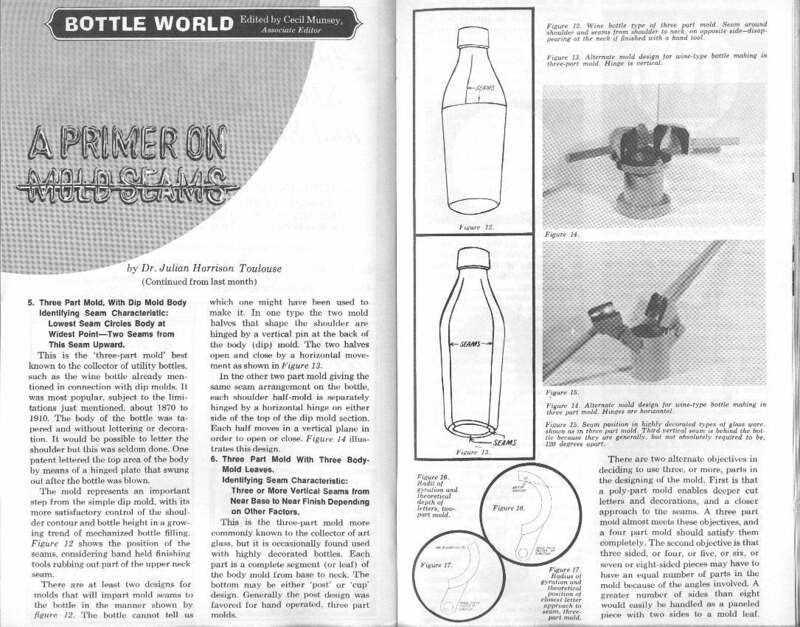 It was the dominant bottle mold type during the last third of the 19th century (Jones & Sullivan 1989; McDougall 1990). The post mold is actually a three (and sometimes more) part mold where the middle portion of the base is formed by a separate small plate or "post" with the neck, shoulder, body, heel, and outside edges of the base formed by the two side mold sections. Sometimes the finish was also partially or totally molded (the later tooled finish post mold bottles and most "ground top" fruit jars from 1858 on). See the ground top discussion on the Finish Types or Styles page for more information. Post bottom mold produced bottle. The "post" seam is a result of a separate base mold section or plate. Bottle pictured is a Warner's Safe Tonic (Rochester, NY) - ca. 1879-1883 (Seeliger 1974). A typical and distinctly "seamed" post mold bottle base is shown in the photograph to the right which is the base of a Warner's Safe Tonic (Rochester, NY) bottle that dates to between 1879 and 1883 (Seeliger 1974). The mold base plate or post produces a round mold seam centered on the base like that pictured. (The pictured base also has the initials A. & D. H. C. which stands for A & D. H. Chambers Glass Company (Pittsburgh, PA.) which was in business from 1843 to 1886 or possibly as late as 1889 (Toulouse 1971, Lockhart pers. comm. 2004).) Perpendicular to each side of the round post seam are straight mold seams which run to and around the heel of the bottle to become the side mold seams. There is no mold seam that runs horizontally around the upper edge of the bottle heel like is found on a cup-bottom mold produced bottle (discussed in next section). 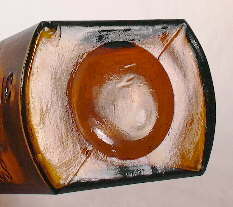 This picture shows well the typical base appearance of a post mold produced bottle. 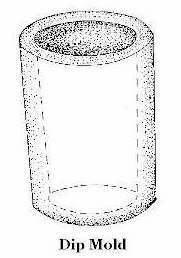 Click on post mold bottle illustration to see a simple drawing that shows the typical side and base mold seam configuration of a post mold produced bottle. 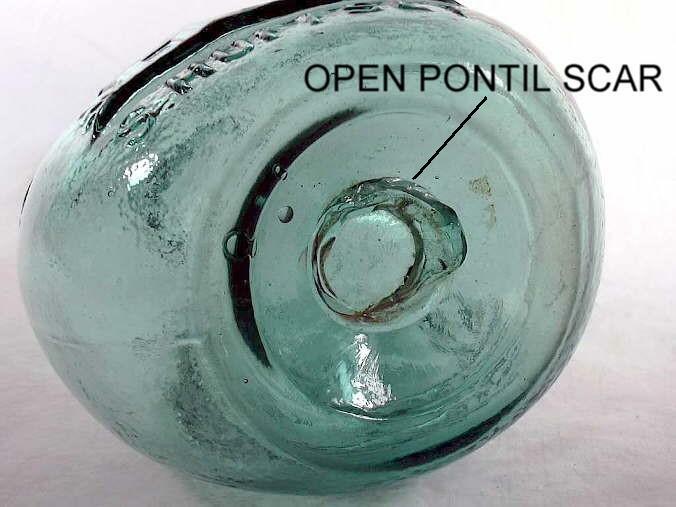 The picture to the left is the base of a calabash bottle that was produced in a post mold in the 1850s, as indicated by the blowpipe ("open") pontil scar. (Click to enlarge.) The side mold seams progress around the edge of the bottle heel and end at the outside edge of the round concave indentation which contains the pontil scar and which was formed by the post plate. The end of the mold seams are not easily seen in the picture, though the round outside edge of the indentation where they end is apparent. Later figured flasks (1850 to 1870 or so) were often made in post molds, though earlier flasks (1815-1850s) were usually made in true two-piece hinge and key molds. There is a lot of overlap, however, particularly during the later 1850s and early 1860s. 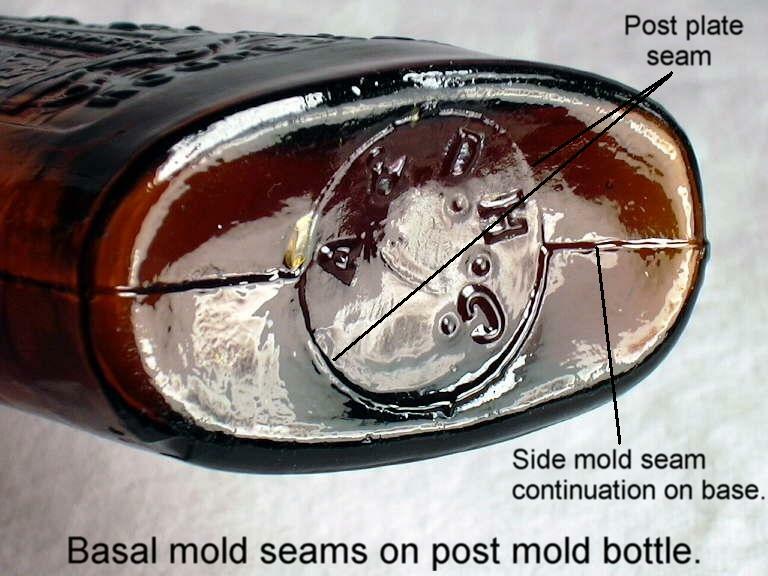 On a significant number of post mold bottles there is an apparent mold induced "edge" or mold seam at the upper edge of the heel that may appear identical to the heel seam produced by the cup-bottom mold discussed next. 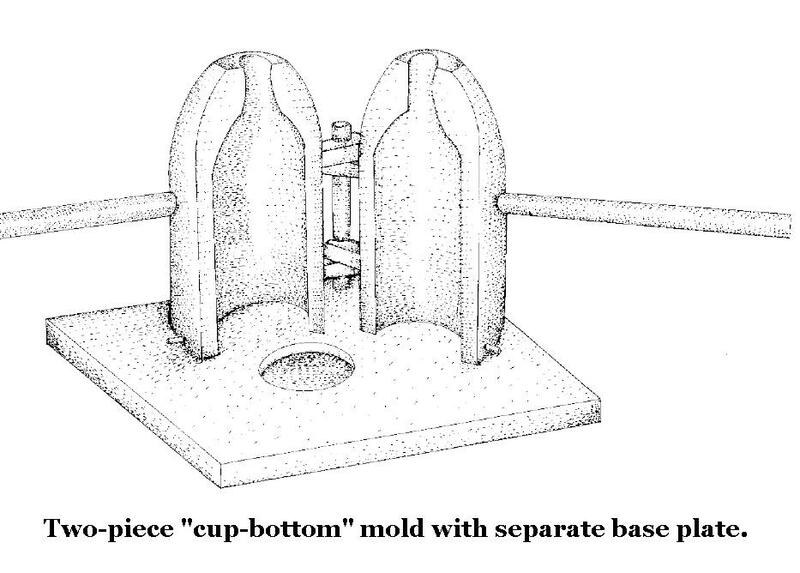 Some have called this a "cup-post bottom mold" because it has features of both in evidence (Ayres 1980). However, any bottle with the mold seam proceeding around the heel and onto the bottle base to mesh with a round/oval mold seam within the confines of the base is still considered a post mold bottle regardless of the appearance of a seam around the upper heel. 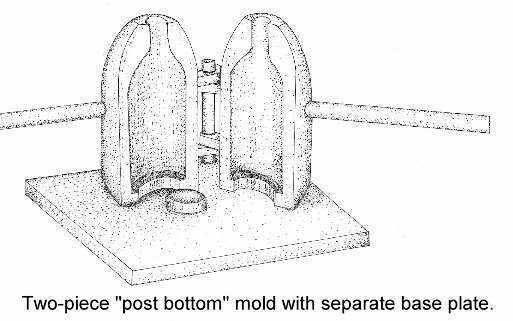 There is the possibility that some post molded bottles with an apparent mold seam on the upper heel are in fact a product of a hybrid mold type that had two moveable parts to the base plate: the regular round/oval post in the middle of the base and another circular plate surrounding the post that meshed with the side halves of the mold and did leave a true cup-bottom mold type seam at the heel. Multi-part base plates are documented on the early Rickett's molds so there is some precedence to this notion (Jones & Sullivan 1989). It is thought more likely that on a majority of bottles with this feature that it is a function of the interface of two mold pieces permanently attached together at that point - i.e., welded or bolted and perpendicular to each other. 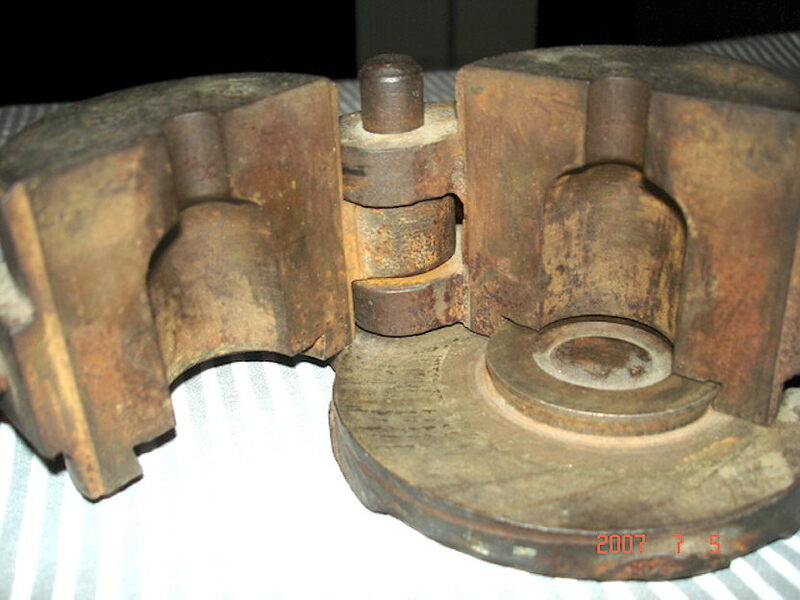 Specifically, each body half of the mold would have two pieces: one being the vertical body side section which extends down to the top of the heel where it would be permanently attached (welded/bolted) to the second part which was a flat horizontal plate with the "half-moon" cut-out for the post to fit in to. There would be the potential of a mold seam formed on the bottle by the intersection of these two immovable mold pieces, though it is not a mold seam in the classic sense which was caused by the interface of two movable mold parts. This conformation is not specifically described in the literature but is inferred from photographs of different molds showing this possibility (McKearin & McKearin 1941; Kendrick 1968; McKearin & Wilson 1978). Since the observed bottles also have an obvious post mold type base seam they would still be considered a post mold product and would follow the dating guidelines noted in the green Bottle Type & Base Related Dating Notes box below. 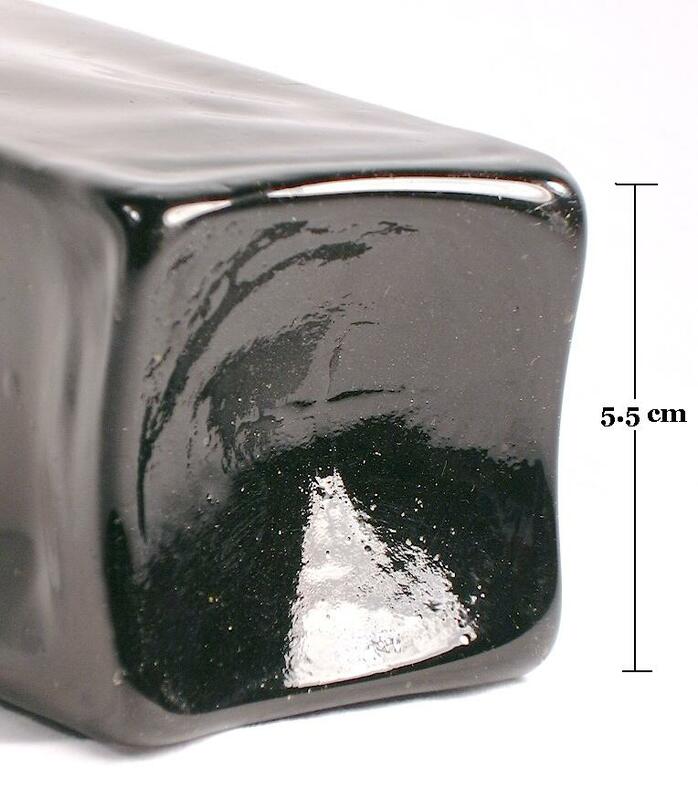 The post shape is usually round - even on rectangular, square, or oval cross-section bottles. 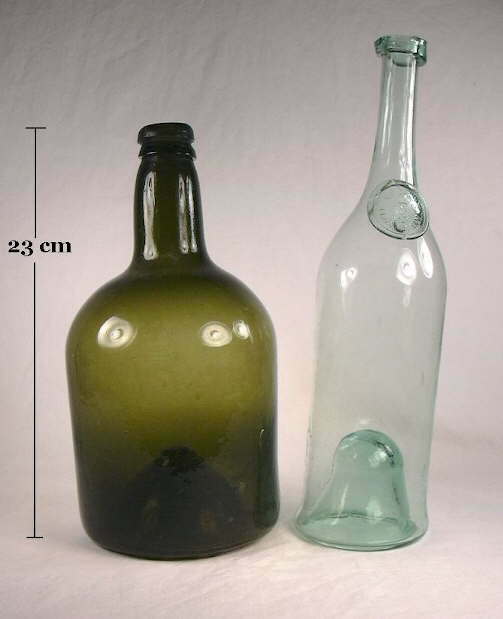 If not round, the post shape will be oval like the middle bottle pictured at the top of this webpage (click bottle bases to view that picture) or the 1860-1880 "spice" bottle (embossed J. W. HUNNEWELL & CO. / BOSTON) illustrated to the left. (Illustration courtesy of California State Parks.) An oval post has only been observed by the author on oval or rectangular cross-section bottles (the spice bottle above right being roughly rectangular) with most rectangular bottles having round posts. Square or rectangular posts are very unusual but do exist as evidenced by the base of the 1860s era gothic pickle bottle at this link- gothic pickle. Click gothic pickle base view to see the square base conformation which was formed by a post base mold which is evidenced - and visible in the image - by the side mold seams continuing around the heel of the bottle to end at opposite corners of the beveled square base indentation. The post mold seam circle (or oval) is frequently hard or impossible to see or feel as it is often integrated into or masked by molded base features like a depression or shallow push-up. In most cases like this the post is what forms the base depression. If the post seam is not apparent on a bottle one is dealing with, look very closely at the heel to base transition area of the bottle. 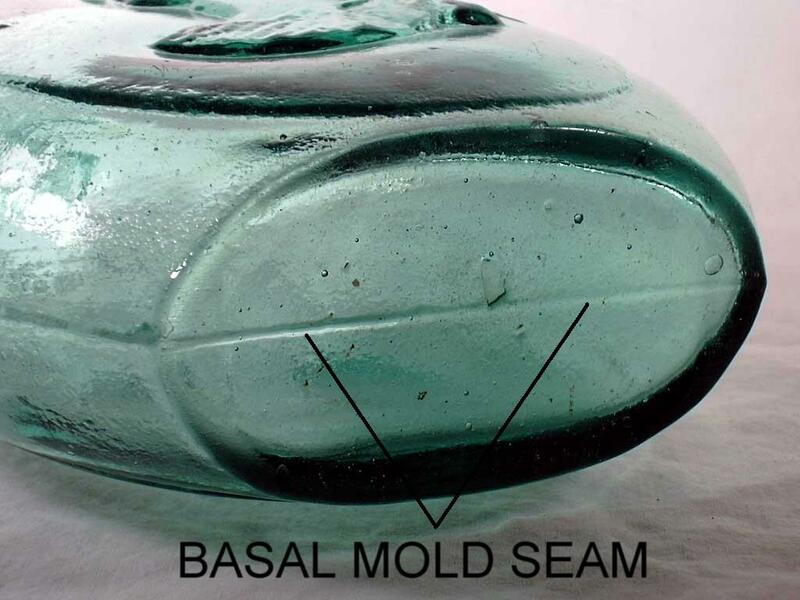 A post mold is always indicated if the side mold seams curl around the heel of the bottle and proceeds at all onto the base of the bottle - even if the round/oval post seam is not obvious. The picture to the right shows the distinct mold seams coming around the heel of the bottle and disappearing at the edge of a molded depression in the center of the base. The post mold seam is largely invisible because it forms the edge of the depression, though it is slightly visible on the lower left side (click to enlarge picture). On many round (in cross section) bottles - particularly larger cylinder liquor bottles from the 1860s, 1870s, and 1880s and some soda/mineral water bottles dating back as early as 1850 - the post seam is difficult to see because it is on the outside edge of the base just around the edge from the lower heel of the bottle. One has to look closely at where the side mold seam curls around the heel of the bottle to ascertain that it does indeed proceed onto the base and that there is a faint (or base feature masked) round post plate mold seam. As noted, if the side mold seam runs around the edge of the bottle heel at all - even if it ends right at outside edge of the base - it is a post mold bottle. Post molds were used to produce just about any type of bottles, with the majority of use of these molds made between the 1850s and the early 1890s. However, similar to so many other aspects of historic bottle dating, there are exceptions or variations based on the type or style of bottle and even bottle size. This is covered in a green box below entitled Bottle Type & Base Related Dating Notes. 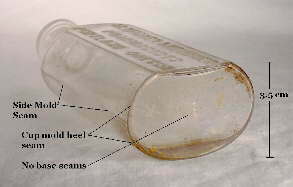 At the upper edge of the heel there is usually a mold line in evidence running around the circumference of the bottle. This line indicates the interface between the lower edges of the side mold pieces and the upper edge of the cup-bottom molds base plate. From this mold line - called a "bottom plate parting line" in the glassmaking world - the side mold seams branch off perpendicular (Tooley 1953). 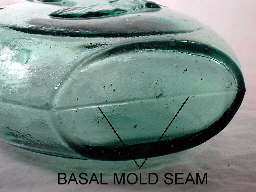 Sometimes this heel mold seam is not obvious or visible and appears integrated into the heel edge of the bottle, though all cup-bottom molds had an interface of mold parts at the heel and the potential for a seam there. The heel seam can also be non-existent on bottles from molds with the previously noted flat, non-cupped mold base plate or no base plate at all (i.e., the floor of the glass works). This seems to most commonly observed on the earlier cup-bottom mold bottles from the 1850s and 1870s which have a relatively sharp and almost non-existent heel (Kendrick 1968). 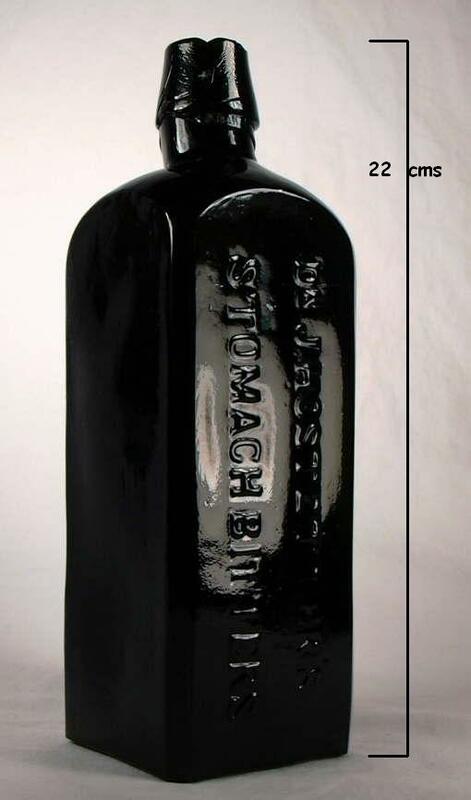 Click Smith & Davis druggist bottle base for an image of an early (ca. 1860) druggist bottle with this feature. Cup-bottom mold produced bottle - no mold seams within the base. Bottle picture is a Cla-Wood Malt Tonic (Portland, OR.) - ca. 1906-1916 (White 1974). 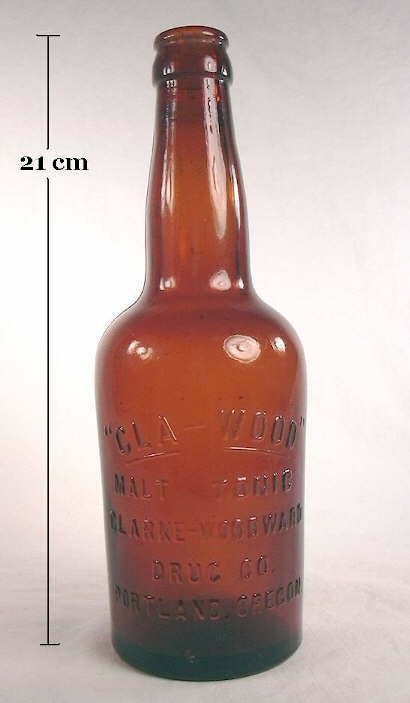 The bottle pictured to the left is a Cla-Wood Malt Tonic (Clarke-Woodward Drug Co., Portland, Oregon) produced in a cup-bottom mold during the early 20th century. Beer/malt tonics were a relatively popular pre-Prohibition product apparently named as such to denote medicinal properties to beer and appease (unsuccessfully) the prohibitionist fervor of the early 20th century. Click Cla-Wood Malt Tonic to view a picture of this entire bottle. 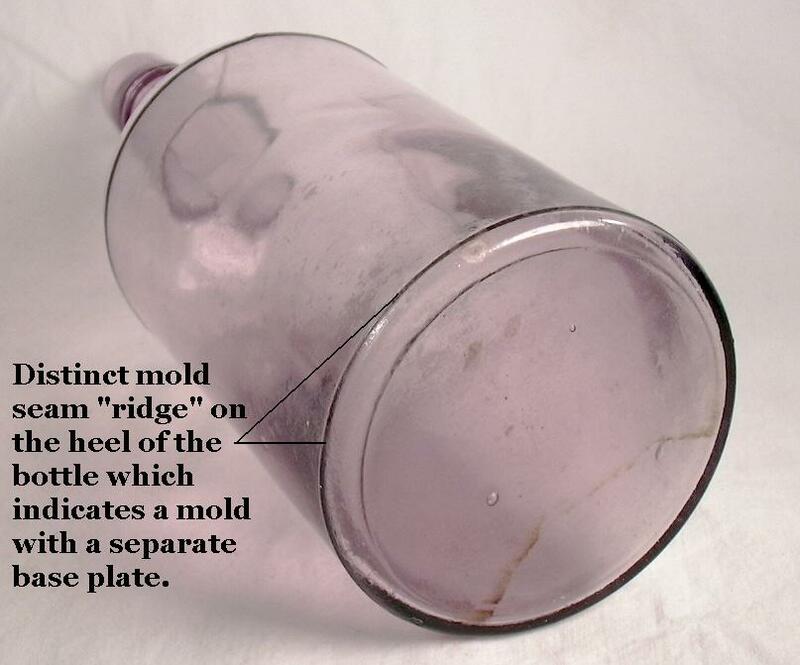 As shown in the picture there are no mold related seams on the base of a cup-bottom mold produced bottle which sets this type of molded base apart from the hinge, keyed, and post-bottom molded bottles which do have base mold seams. There can be embossing on the base (e.g., makers marks, mold marks, product names) as well as mold air venting marks during the later end of mouth-blown bottle production (base air venting virtually always places a mouth-blown bottle after 1900). The druggist bottle pictured to the right is a relatively early cup-bottom mold produced bottle which also has a tooled finish, is embossed via an interchangeable mold plate (i.e., "plate mold"), and has no air venting marks. 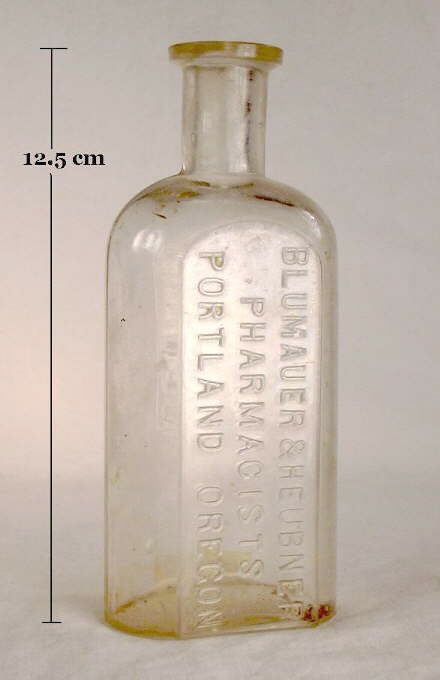 This bottle is embossed BLUMAUER & HEUBNER / PHARMACISTS / PORTLAND, OREGON vertically within the plate. Based on listings in the Portland City Directories, these two individuals were in a partnership for two years - 1878 and 1879. There were no directory listings prior to 1878 (though they could have entered into a partnership sometime during 1877 without getting into that years listing) and Blumauer was listed as the sole proprietor in 1880. This type of information produces a very narrow and reliable date for when this bottle was produced and is what provides support for the dating observations like those found in the box below. Click Blumauer & Heubner Druggists to view a picture of the entire pharmacist bottle. Cup-bottom molds were used to produce just about any type or class of mouth-blown bottles, with the majority of use made between the mid to late 1880s and late 1910s when automatic machines dominated the bottle making market. 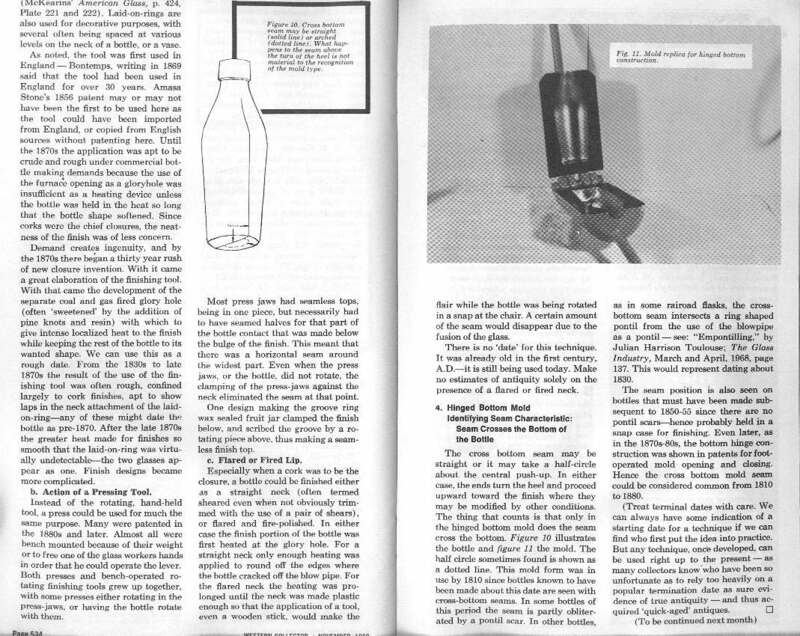 As noted, cup-bottom molds continued to be the mold type of choice on automatic bottle machines also (Toulouse 1969b). However, similar to so many other aspects of historic bottle dating, there are exceptions or variations based on the type or style and even size of bottle. This is covered in a separate green box section immediately below entitled - Bottle Type & Base Related Dating Notes. These dating estimates are primarily directed towards post-bottom and cup-bottom mold produced bases and are based on the authors empirical observations over time in conjunction with an wide array of published references (noted on the Bottle Finishes page) which provide relatively precise company dating for various types and styles of historic bottles. As there are numerous exceptions to these general observations, dating accuracy is enhanced by using these base related date ranges in conjunction with other diagnostic features as noted on the Bottle Dating pages. The following information is, however, considered accurate for a majority of bottles within the type classes listed. See the Bottle Typing/Diagnostic Shapes page for information about the types or classes of bottles noted below and more information on dating. There was a distinct tendency for smaller, lighter, and/or narrower based bottles of any type to have been made in cup-bottom molds earlier than larger, heavier (thicker glass), and/or wider based bottles. Besides druggist bottles which are discussed specifically below, small patent medicine bottles (<6"), most types of ink bottles, extracts, perfume/cologne, and some small food bottles were largely being made in cup-bottom molds by the mid 1870s. 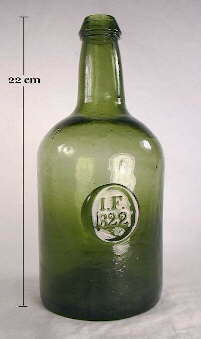 Related to the above was a distinct trend towards the larger (about 8" and above in height), wider, and/or heavier (thicker glass) bottles to be predominately made in post-bottom molds up until the late 1880s and early 1890s for many types or classes of bottles and even later for some types, as noted below. Specifically, this includes larger patent medicines bottles, square "bitters" shaped bottles (e.g., Hostetter's Bitters shape), larger and/or taller liquor bottles, soda & beer as noted, fruit jars, and larger food bottles like pickle bottles. 1. 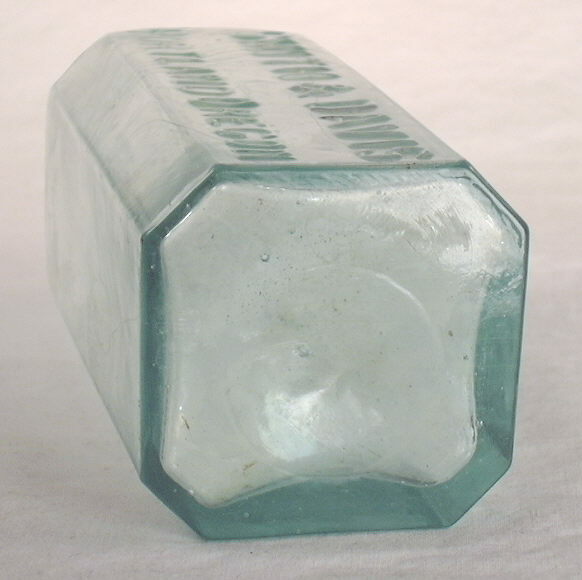 Small (generally 7-8" or less in height) druggist bottles of most shapes (square, round, rectangular, oval) were cup-bottom molded beginning by at least by the early 1860s and by the mid 1870s were virtually exclusively cup-bottom molded. Post-bottom molded druggist bottles are very unusual, typically round, and usually date prior to the mid-1870s. (Interestingly, druggist/drugstore type bottles also have tooled finishes earlier than most other types of bottles.) Some of the earliest non-pontil scarred druggist bottles (1860s and early 1870s) appear to have been blown in molds with flat or no base plates (i.e., the two mold halves simply sat on the floor of the glass works) and have very flat bases with no indenting and sharp, almost non-existent heels (Kendrick 1968). ( These type molds are also considered cup-bottom molds.) These same general observations also hold for smaller patent/proprietary medicine bottles, smaller extract bottles, most smaller ink bottles (excluding bulk or master ink bottles), smaller cologne/perfumes, and small food bottles. 2. Soda and mineral water bottles - which have some of the thickest glass of any bottles - were produced in post base molds as early as the late 1840s or early 1850s (McKearin & Wilson 1978). The pontiled soda bottle pictured under the "Bare Iron Pontil" discussion earlier on this page was produced in a post mold and definitively dates from the early 1850s (Markota 1994). 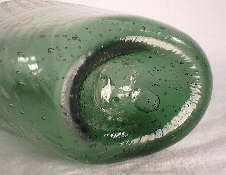 On these types of bottles, the post base mold base seam is sometimes just inside the outside edge of the base and difficult to discern. 3. Thick glass soda, mineral water, and beer bottles continued to be produced in post-bottom molds up until at least 1900, with the major changeover to cup-bottom molds roughly occurring in hand with the adoption of the crown cap finish. Even then, post-bottom molds were used on soda and beer bottles dating at least as late as 1910 or so (Pollard 1993). cup-bottom molded soda & beer bottles are very unusual prior to the mid 1890s and usually date 1900 or later (empirical observations). 4. Common styles of small (pint or less) liquor flasks were typically being produced in cup-bottom molds from the early to mid 1880s on. Prior to that, post-bottom molds were most common during the late 1860s to about 1880; keyed or hinged molds were the most commonly used on liquor flasks prior to the mid-1860s. 5. Canning/fruit jars of all sizes (but all with wide bases) appear to have been most commonly made in post-bottom molds from the mid-19th century up until at least 1900 and often until machines replaced mouth-blown jars in the early 20th century. cup-bottom molded, mouth-blown canning jars appear to be much less common than post-molds and typically post-date 1900 (Creswick 1987, empirical observations). This same observation is true of larger (tall and/or wide) food bottles like square and cylindrical, wide mouth, pickle/preserved food bottles and jars - those made prior to 1900 tend to were blown in post-bottom molds while those after that time are typically cup-bottom mold formed. 6. Large, cylinder liquor bottles (like "Western style" fifths) were typically post-bottom mold produced up until the late 1880s with cup-bottom molds dominating by the early to mid-1890s (Thomas 2002). However, on the post-bottom molded bottles the base post-bottom mold seam is often right at the outer edge of the base, just inside of where the base starts and heel ends making it very difficult to differentiate from a cup-bottom mold seam. Look closely at the side mold seam where it touches the heel of the bottle. If there is any continuation of the side seam around the heel then it would be considered post-bottom mold formed and likely made prior to the early 1890s. 7. Large (8" or more) patent and proprietary medicine bottles (including bitters) were post-bottom mold produced up until the early 1890s. Large cup-bottom molded patent/proprietary medicinal bottles usually date between the early 1890s and mid to late 1910s. Rounded bases were designed to do the opposite of most bottle bases - to ensure that the bottle was not left standing upright. The point behind the rounded bottom was to ensure that the bottle was left on its side so that the wired down cork would not dry out and shrink allowing the contents to loose carbonation and/or evaporate (Riley 1958). 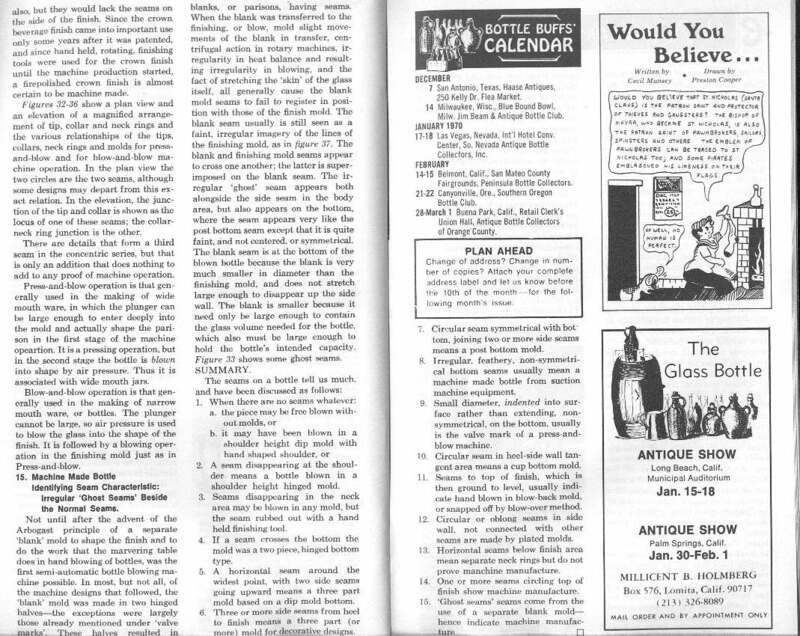 The typical rounded base bottle was made of thick heavy glass and used for carbonated soda, mineral water, and in particular, ginger ale (Munsey 1970). Some rounded bottom soda bottles actually have a small flattened area in the middle of the base that allows for the bottle to stand upright though somewhat precariously. These are referred to as "club" or "tenpin" in shape, "semi-round", or "egg-shaped" (McKearin & Wilson 1978, Elliot & Gould 1988, Jones & Sullivan 1989). 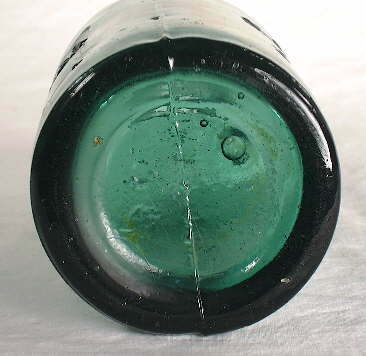 These type bottles are commonly referred to as "round bottom sodas" or "ballast bottles" since it is believed (and may be true) that many of them were imported from England as "ballast" (weight) in ships returning to the United States. A common variation is the "torpedo" bottle which is distinctly more pointed on the end with an bulging "amphora-like" body. The torpedo style was first used in England at least as early as 1809 when a patent was granted to William F. Hamilton. These type bottles are often referred to as "Hamilton's" by English collectors (McKearin & Wilson 1978). Torpedo bottles are also known by some as "bombs" (Elliott & Gould 1988). 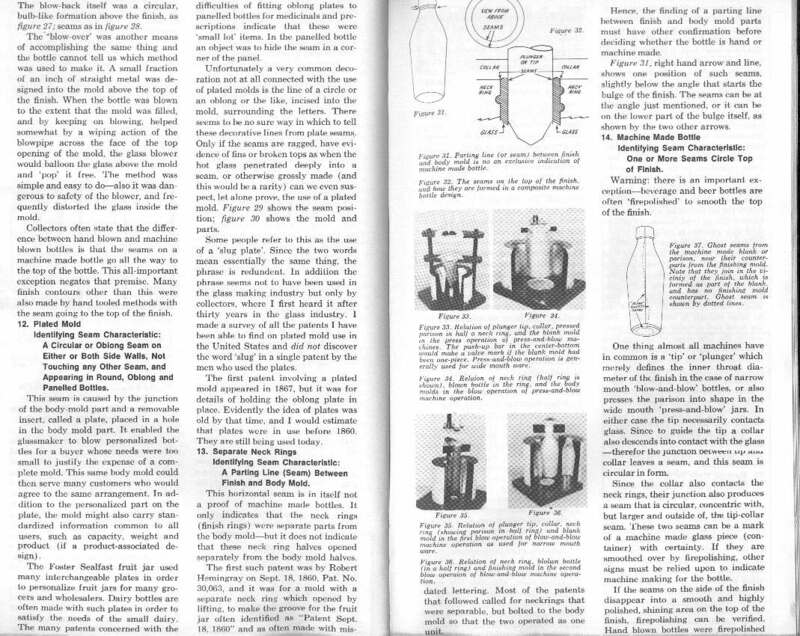 A picture of a typical pointed base torpedo soda bottle is pictured below right. It is embossed with "Walkden Aerated Water Co." (Manchester, England) and dates from approximately 1880-1890. 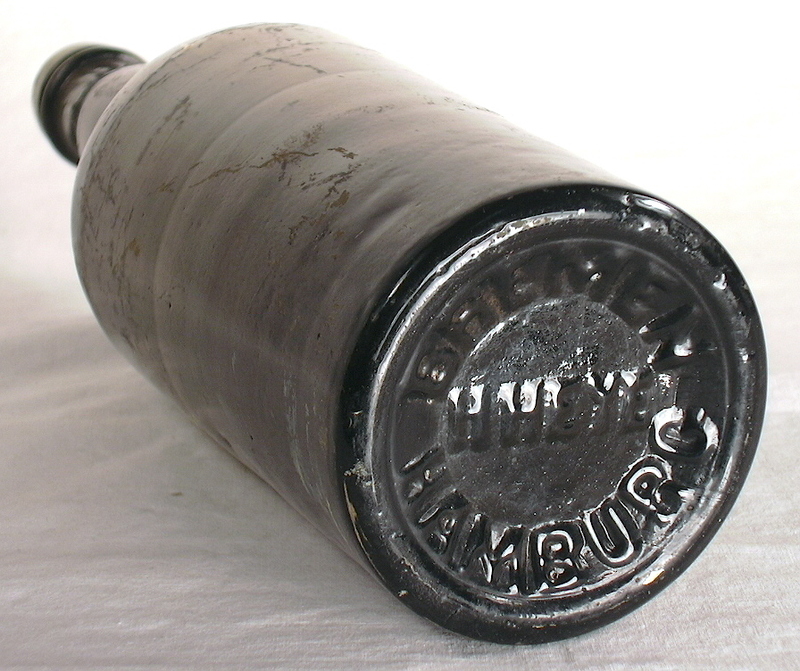 Round bottom & torpedo bottles were usually produced in a true two-piece mold where the neck, shoulder, body, and entire base (and sometimes all or a part of the finish) were produced by the two halves of the mold. As such these type of bottles are simply a rounded base version of the "hinge" mold discussed earlier and exhibit one continuous mold seam that runs from one side of the body, around the base, and then up the other side. The bottle pictured above is a Berlin Mineral Water (Boston, MA.) that likely dates from the 1880s as it has an applied blob finish and evidences no mold air venting. Click round bottom soda to view a picture of this entire bottle. The majority of these type bottles found in the United States were imported from Great Britain and frequently embossed with company names and cities from England and Ireland - Belfast being a very common point of origin. However, some were - like the bottle pictured - either made in the United States or made overseas for U.S. bottlers. They were advertised in the catalogs of U. S. bottle makers during the early 20th century as "Round Bottom Ginger Ale" bottles (Illinois Glass Co. 1903, 1908, 1911). The majority of these bottles - round bottomed or torpedo - date from the 1870s to the 1910s, though there are some American made torpedo bottles (Eastern Seaboard) that date back as early as the 1840s (McKearin & Wilson 1978, Baltimore Bottle Club 2002). Most have a blob style finish, occasionally an oil or mineral finish, though some were made with a Codd finish/closure and later ones (early 20th century) were produced with a crown finish (Elliott & Gould 1988). The vast majority of rounded or pointed base bottles were designed and used for non-alcoholic, carbonated beverages. However, like with most types of bottles there are exceptions. Some mid-19th century liquor flasks came with rounded bases, though the bottles are flattened in cross section ("flask shaped") not round. There were also oddities like the bottle pictured to the left which is embossed Aromatic / Disinfector / Pat. / Sept. 9, 1890, which research (on the internet) shows to be from a company located in at least Philadelphia and New York. It has a rounded base like the soda bottles but has a flattened back so that the bottle will not roll on a flat surface. The contents of this bottle were some type of hand or general use disinfectant solution. The bottle was inserted upside down into a metal appliance that allowed for the controlled dispensing of the contents; thus, the upside down embossing (Rochester Midland Co. 2005). The extreme rarity of this bottle as well as some diagnostic features (applied finish, air venting pattern of a single mark on each shoulder) indicates that it was very likely produced for a very short time after patenting, i.e., around 1890-1892 (empirical observations). If there is one constant in the identification and dating of historic bottle it is that there are many exceptions to the general facts noted on this website. However, this does not negate the utility of such information which is based on the probability that in a large majority of cases, the noted trends and information are correct or applicable. It is the best one can do, though there are also many bottle "mysteries" which present unlimited opportunities for further research, though may never be unraveled. All turn-mold bottles (also called "paste mold") are round in cross section and have round bases since no other shape could be turned or twisted in the mold to produce the seamless body distinctive of these bottles. 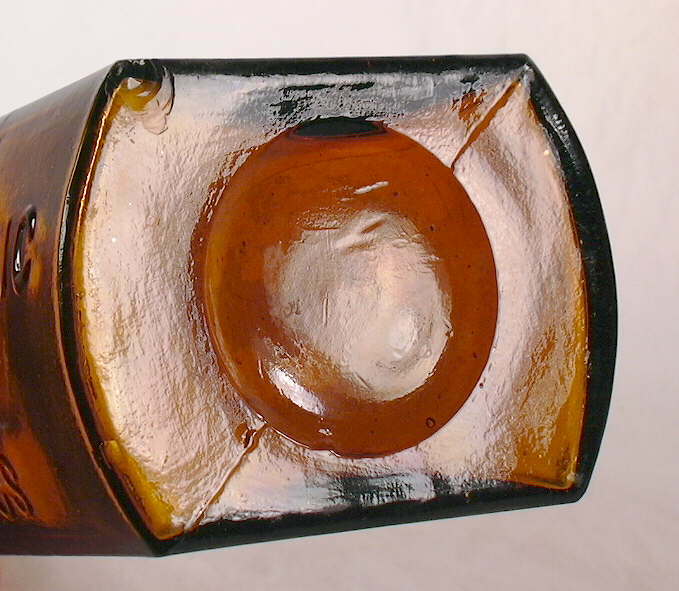 The base of a turn-mold bottle is usually at least slightly indented and often has a deeply indented push-up (aka "kick-up") like the bottle pictured to the left. 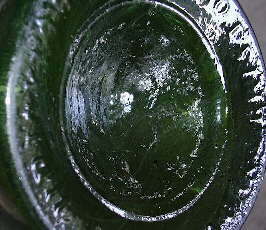 The base encircling mold seam from a base plate (which most molds had) would not be evident at the heel of the bottle due to the bottle rotation, though may be vaguely implied by a subtle ridge at the top of the heel. There would generally be no embossed lettering on the base of a turn-mold bottle since the base turns with the rest of the bottle, though there may be bumps (or a mamelon - see picture) or "dots" in the center of the base which would not inhibit the rotating of the bottle in the mold. Mold air venting is not typically visible on turn-mold bottles since the evidence of such was erased by the rotation, although it is thought that the mamelon itself was often the result of an air venting hole in the middle of the base. Mamelons are commonly seen on the bases of turn-mold bottles (Jones & Sullivan 1989; Boow 1991). To view the entire patent click on the following link: Patent #364,840 - "Mold for Blowing Turned Bottles" - June 14, 1887. Toulouse (1971) noted in his write-up for Streator that "...by 1885, with 60 blowers (many of them German "twister blowers")..."; twister blowers being glassblowers producing turn-mold bottles. In any event, base embossed turn-mold bottles are uncommon the most abundant observed by this author are German made turn-mold beer bottles base embossed variably with H. HEYE and BREMEN and/or HAMBURG . 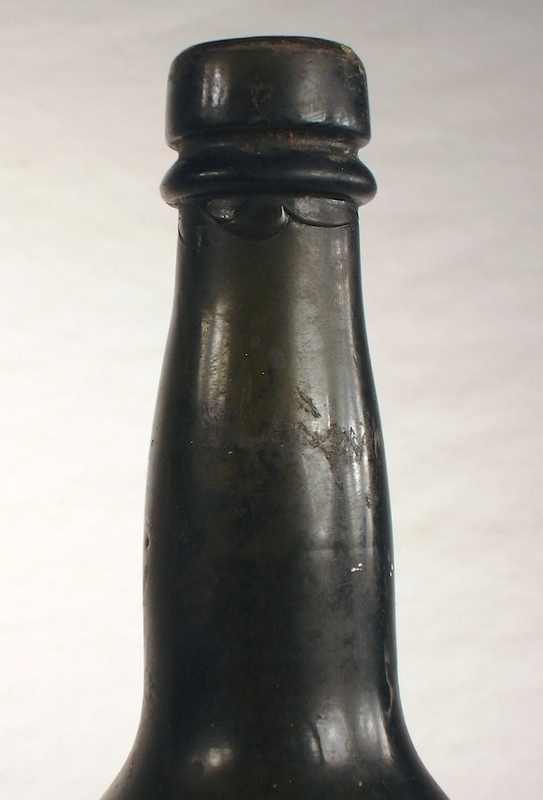 Click on the following links to see images of an H. HEYE base embossed beer/ale bottle that dates from the late 19th century most likely: full view of the bottle (9.5" tall); close-up of the neck and crudely applied mineral type finish that is typically seen on beer bottles of a late 19th century manufacture; base view showing the embossing BREMEN / H. HEYE / HAMBURG with typical rotation marks on the body of the bottle in evidence. These German produced bottles are quite commonly encountered in the American West (empirical observations) and probably throughout North America. 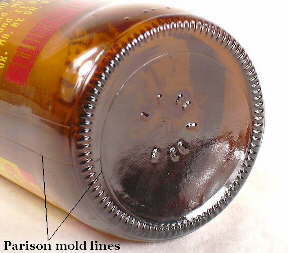 In addition, some Japanese turn-mold beer bottles have been observed with base embossing. This is described on the Miscellaneous & Foreign Bottle typology page in the Chinese/Asian Bottles section. The bottle pictured to the above left is a labeled Vin Zymo Elixir Wine Tonic (San Francisco, CA.) that is a tall, olive green, cylinder with a style shape typically used for red wine (e.g., Bordeaux region wines). The label on this bottle implies a dating to the mid-1910s based on the contents or capacity notation, which was not required prior to the early teens and the high alcohol content (30%) with no mention of "medicinal use" which likely makes it a pre-Prohibition (pre-1920) product (Lockhart pers. communication 2003). 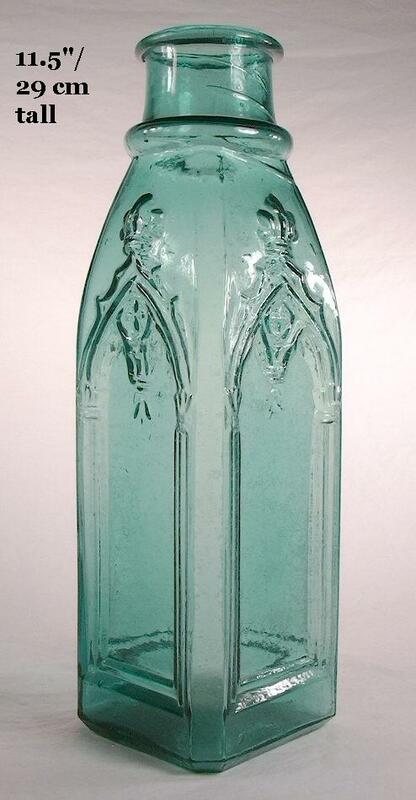 This bottle could date from the same era as the label since turn-mold bottles were still being produced at least as late as the early 1910s (Illinois Glass Company 1911, Toulouse 1969b)). However, the bottle could possibly pre-date the label and have been reused or recycled for this product since this bottles method of manufacture (turn-mold, tooled finish) was being used at least as early as the late 1880s. It is likely the bottle was made at the time the label was made (mid-1910s) though there is way to ascertain this for certain. Click Vin Zymo Tonic to view a picture of this entire bottle and label. 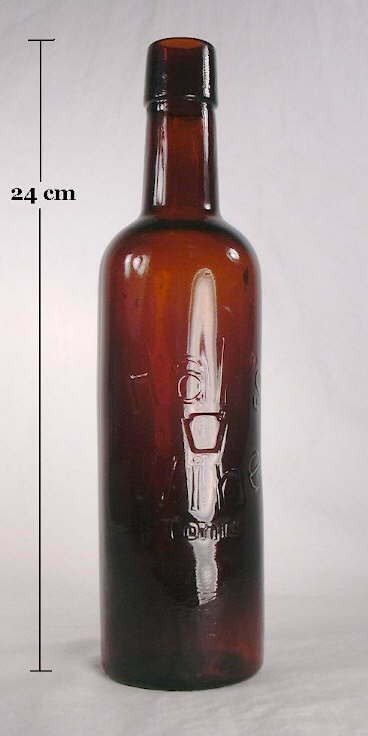 The large majority of turn-mold bottles were made between the 1880s and the late 1910s, with the most made after the mid-1890s until automatic machines dominated the market (Toulouse 1969b). Most of the bottles produced were for liquor, wine, beer, mineral water, and occasional other beverages as well as some barber bottles and "shop furniture" bottles (empirical observations). 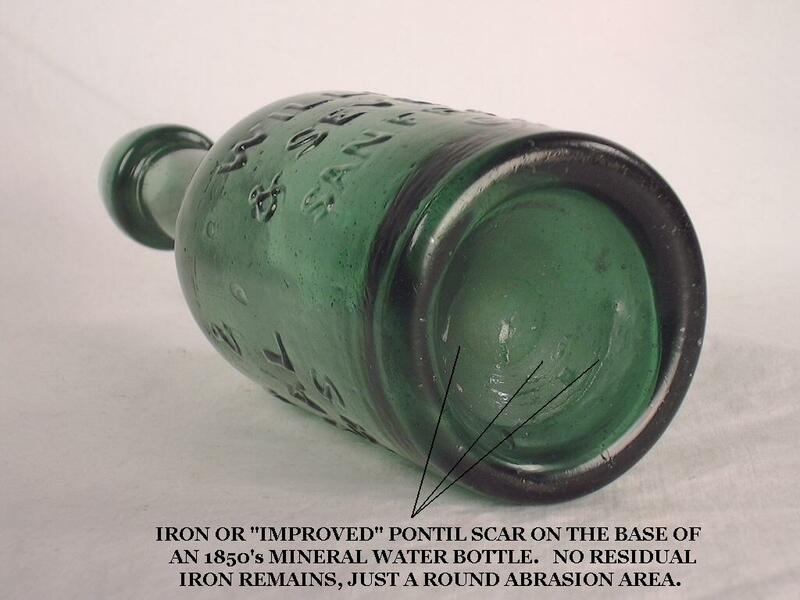 Pontil scars are very unusual on turn-mold bottles with the exception that they are frequently seen on turn-mold barber bottles from the late 19th and even early 20th century and occasional shop furniture bottles made during the last half of the 19th century. All machine-made (semi-automatic or fully automatic) bottles have in common the fact that they were blown with the air applied by a machine, not that of a glassblowers lungs. For a general overview of machine-made bottle characteristics and diagnostic features consult the page entitled Bottle Dating: Machine-made bottles portion of the Dating Key. The 1908 photo to the right above is from the Lewis Hine collection at the Library of Congress and shows an early semi-automatic 4 mold milk bottle machine, with the following caption: "Machine that blows 4 milk bottles at a time. No "lung blowers" employed. Travis Glass Co., Clarksburg W. Va. Manager says machines are fast coming into play in bottle industry, plans eventually to have machines in place of "carrying in boys." Location: Clarksburg, West Virginia" (Library of Congress). This two table semi-automatic machine would have been hand fed with glass and does have the two different mold sets with the parison molds most likely the set on the right. Blowing air would have been supplied by the pipes and hoses coming in from above. A couple other distinctive machine-made base features are the result of the mechanics of how the machine operated - suction scars and valve marks. These are covered below. The bases of bottles produced by some early blow-and-blow cycle semi-automatic machines can be hard to distinguish from the bases of many late 19th and early 20th century mouth-blown bottles due to an absence of machine induced diagnostic evidence on the base. An example is the bottle pictured to the left which is the base of a machine-made, post mold produced Hall's Wine Tonic. It is most likely English made - though found commonly in the U.S. - and dates from the early 20th century (approximately 1910-1920). This bottle could have been produced by either a semi-automatic or fully automatic non-Owens bottle machine (most likely the former). It was not produced by an Owens Automatic Bottle Machine since the base of the bottle is not marred by any suction scarring or even any parison mold seams. The lack of parison mold seams on the base likely indicates an early semi-automatic machine production by an unknown machine. The bottle does exhibit all the other standard machine-made features (#1-#4, #6) as described at the following link - Bottle Dating: Machine-made bottles portion of the Dating Key. Click Halls Wine Tonic to view a picture of the entire bottle. If one only had a base fragment for this bottle, it would likely be interpreted as a mouth-blown bottle; the diagnostic features on the body and/or finish are needed to make the distinction here. In general, bottles produced by semi-automatic machines are impossible to differentiate from those produced by non-Owens type fully-automatic bottle machines. This is because a non-Owens automatic machine was essentially a semi-automatic made automatic with the addition of a glass feeding device (i.e., a gob feeder). Excluding the base, semi-automatic machine made bottles are physically indistinguishable from all types of machine-made bottles. The base related exception is that the Owens Automatic Bottle Machine will often (primarily in the early days of the machine) leaves a distinctive scar on the base which differentiates its products from both semi-automatic and other non-Owens fully automatic machines; a subject covered in the next section (Toulouse 1967; Miller & McNichol 2002). "The last group of bottles...are those that have parison mold lines but no valve mark or suction scar. They could have been produced by a number of different machines from early semi-automatics to fully automatic machines. The Hartford Empire Company I. S. (Individual Section Machine) that was introduced in 1925 was one of these machines and it is one of the major types of glass blowing machines in use today (Miller and Sullivan 1991:103). In this cluster of machines, the parison is filled by a gob feeder, partly blown to fill the parison mold and then transferred to the blow mold for completion. In the transferring of the parison to the blow mold, the base of the two molds almost always becomes off-centered which leaves faint mold lines from the parison mold on the base and sides of the vessel. Look at any modern glass bottle and you can almost always see a slightly off center circle on the base. Coming off that circle are some wavy mold lines that are a little off center from the lines going up the side of the vessel at the base but which come back into alignment near the neck of the vessel. These have been referred to as “ghost mold lines” but might be more accurately called parison mold lines." This feature on the base (and body) of the bottle is also, as noted, called a "parison mold seam" or "parison mold line." These features (base and side parison mold lines/seams) are portrayed and pointed out in the image above (click to enlarge). These machine-made base markings never have the "feathering" of the true suction scar (covered next); otherwise these type bottles share the same diagnostic features as the Owens Machine produced bottles as covered on the Bottle Dating: Machine-made bottles portion of the Dating Key. A suction scar is the diagnostically distinctive mark most commonly found on the base of earlier bottles produced by the Owens Automatic Bottle Machine. 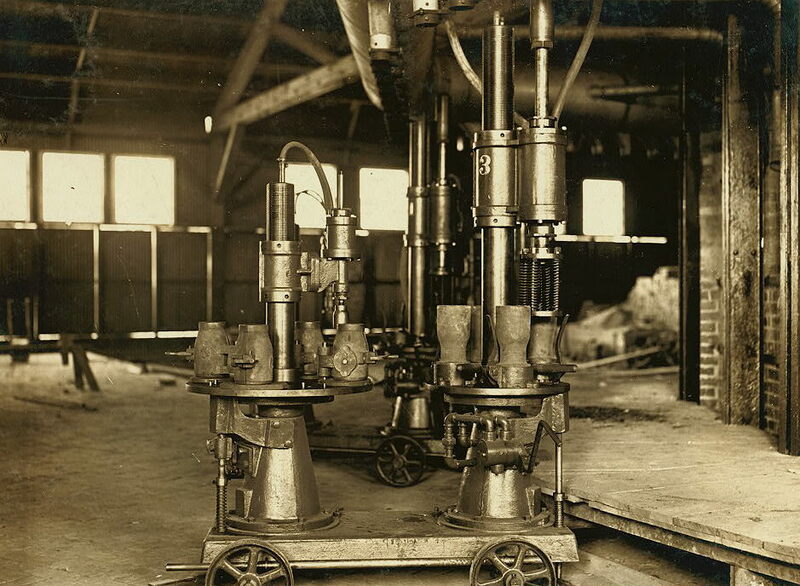 (An image of an early Owens Bottle Machine #6 is to the left below [Walbridge 1920]). 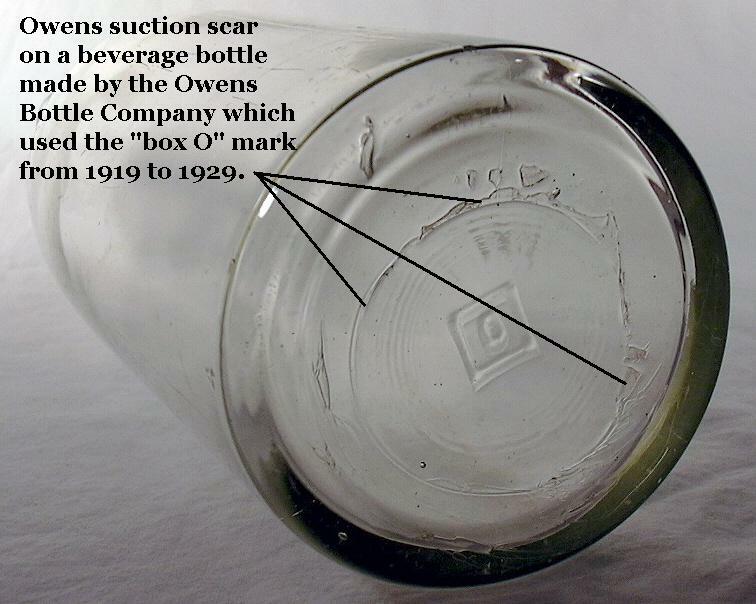 The mark is a result of a mechanical blade or "knife" which cut off the glass being drawn upwards into the blank or parison mold via a suction process once enough glass was drawn to produce the desired bottle (Russ Hoenig [Owens-Illinois Glass Co. engineer] pers. comm. 2009). 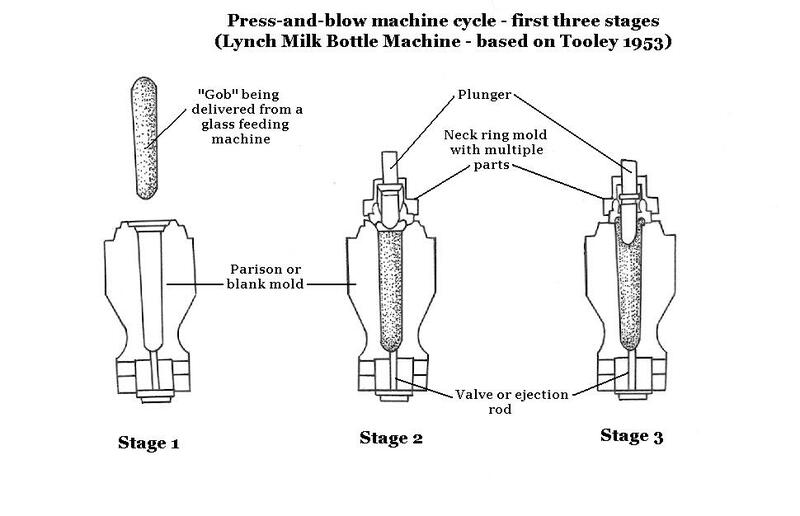 Click Owens machine cycle to see an illustration of a portion of the Owens machine cycle (Stages 2 and 3) which shows schematically how the knife cuts off the glass (after Tooley 1953). Suction scars are a more or less round, very fine line that is can be either incised into (typical) or raised above the glass surface. If the mold blade was dull or the base of the blank/parison mold worn or poorly fitting (i.e., not all properly maintained) the scar gets a "feathered" or "splotchy" edge to it, like shown in the picture to the right. The feathering is a result of the sliding or "smearing" action of the blade/knife and the rolling of slivers of glass in the narrow clearance between the blade, mold, and the drawn glass (Russ Hoenig [Owens-Illinois Glass Co. engineer] pers. comm. 2009). 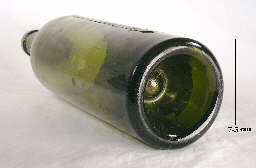 The pictured bottle actually shows some of the smeared glass slivers imbedded into the bottle base adjacent to the suction scar itself. Suction scars are usually not perfectly centered, particularly on square and oval bottles, and will frequently slop over onto the heel and lower sides of non-round bottles. This latter features is particularly pronounced on smaller bottles (Toulouse 1969b; Miller & McNichol 2002). A very roughly cut-off suction scar like shown in the picture is usually the product of an earlier Owens machine, i.e., 1905 to maybe the mid to late 1920s, though suction scars with some minor roughness are commonly seen on bottles made into the 1930s and can be possible at any time up to the end of Owens machine use in 1982 if the parison mold/blade complex was not properly maintained (Russ Hoenig [Owens-Illinois Glass Co. engineer] pers. comm. 2009). Suction scars are also sometimes hard to see - particularly on small bottles - due to glass temperature variations and the quality, maintenance and cleanliness of the molds used (Miller & Morin 2004; empirical observations). In addition to more conscientious maintenance, it is known that various patented improvements were made to these machines in the early 1930s that appear to have resulted in cleaner, less "messy" scars (Pearson 1928; Lockhart pers. comm. 2006; Russ Hoenig pers. comm. 2009). As noted above, non-Owens machines from the 1910s up to the present day produce a base marking that is largely indistinguishable from the suction scar if the suction scar is not "messy," i.e., has no feathering. Bottles with suction scars date no earlier than 1905 and typically are after about 1910 when the Owens machine began its climb towards the dominance of the bottle market. By 1917, 90-95% of the bottles in the U.S. were being made by machine with fully half of the total made by the Owens machines (Barnett 1926; Miller & Sullivan 1981). Thus, half the American made bottles from the late 1910s would have suction scars. The Owens machine dominated the bottle market through most of the 1920s, though by the end of that decade, gob feeder machines surpassed the Owens machines in production with only 30% of U.S. production being Owens machine produced by 1947 (Miller & Sullivan 1981). The last Owens machine in the U.S. reportedly shut down in 1982, though they could still be in use in other countries (Miller & McNichol 2002; Russ Hoenig [Owens-Illinois Glass Co. engineer] pers. comm. 2009). 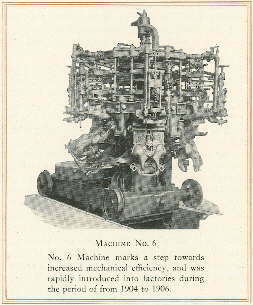 It should also be pointed out that by the 1920s, competitive and often smaller, European suction based machines (e.g., Redfern, Wilzin, Severin) were also competing with the Owens machine. It is quite possible that the operation of these machines also resulted in some type of base suction mark like that formed by the Owens machine since the parison/blank mold glass feeding process was the same (Pearson 1928). However, it is likely that a very large majority of bottles with suction scars in the U. S. were made by the Owens machine. Owens machine formed suction scars are sometimes mistaken for a pontil mark by the uninitiated; especially the rougher ones like pictured above. The online auction site eBay® frequently has Owens machine produced bottles listed for auction by inexperienced sellers as having a pontil mark. However, no true pontil scarred bottle would have the side mold seams running to the top of the finish like with a machine-made bottle. White (1978) called the suction scar a filamented ring, which though descriptive of a roughly cut suction scar, has apparently not been particularly accepted or used since its publication. Also be aware that a well centered (rare) and neatly sheared suction scar could be mistaken by some for a post-mold base plate seam since it could appear that the side mold seams merge with this base circle. However, the suction scar is really "attached" to the parison mold "ghost" seams not the blow mold seams as the suction scar was made at the base of the parison mold. 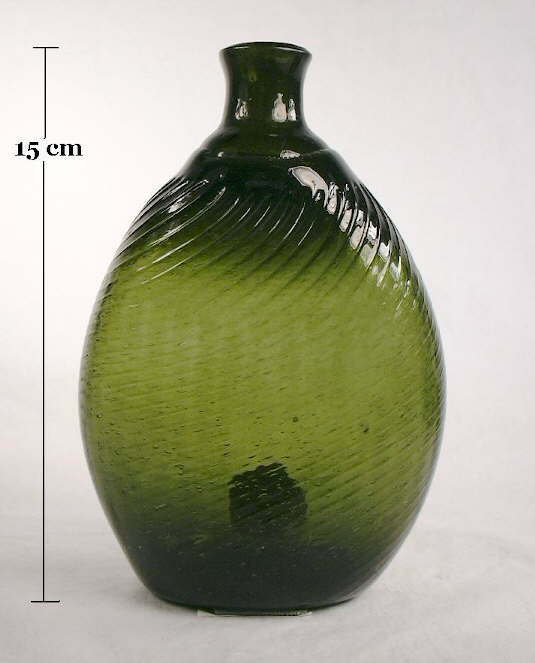 Close inspection of some bottles is necessary to differentiate this feature - a suction scar will usually be very fine and typically (but not always) incised into the glass and a true post-mold base plate seam will be wider and almost always protrudes slightly. 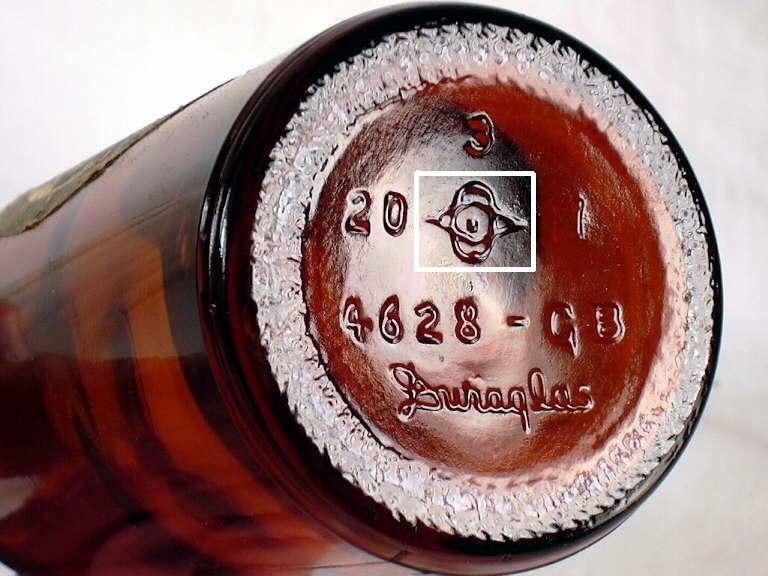 A valve or ejection mark on the base of a bottle is a definitive indication of machine-made manufacture by a press-and-blow type machine (Miller & Morin 2004). This mark was formed by machines that utilized a push-rod valve to eject the partially expanded parison out of the blank mold (the "press" part of the process) when shifting the parison to the second blow mold (the "blow" part of the machine process) (Tooley 1953). To view illustrations of how press-and-blow machines operated and how the valve/ejection mark was formed, click on the following links: press-and-blow machine cycle - stages 1-3; press-and-blow machine cycle - stages 4-7. 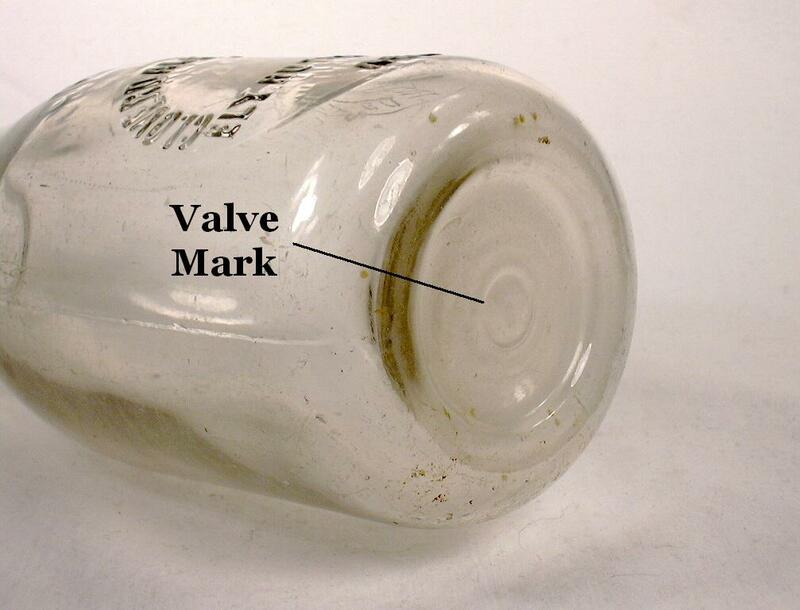 Valve marks are almost exclusively found on wide mouth machine-made bottles - food bottles & jars, milk bottles, and canning jars. These are the types of bottles generally made by press-and-blow machines. Toulouse (1969b) noted that this mark is "...most often found on wide mouth foods of the 1930s and 1940s and even later, and on many milk containers." The mark is indeed most commonly observed on wide mouth milk bottles and food jars made between the early 1900s through the 1940s, and occasionally after that. It is also very common on canning jars, including many that were produced by semi-automatic press-and-blow machines possibly as early as 1898 (Birmingham 1980, Leybourne 2001). It should be noted that the first production bottles known to have been made on semi-automatic (press-and-blow) machines were wide mouth Vaseline bottles made by the C. L. Flaccus Glass Co. (Beaver Falls, PA.) in 1894; these bottles usually exhibit valve marks on the base (Lockhart et al. 2007d; empirical observations). Valve marks are very unusual on narrow necked/mouth (bore) bottle types though there are some exceptions as valve marks are occasionally seen on early (1910s) machine-made beer and soda bottles. 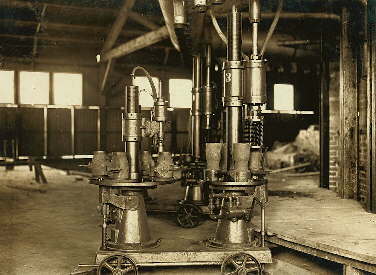 At least one manufacturer (Cumberland Glass Manufacturing Company, Bridgeton, NJ) invented and used a type of semi-automatic press-and-blow machine in 1910 which did produce narrow neck bottles that most likely also resulted in a valve mark on the base of the bottles produced by that machine in the early 1910s (Lockhart pers. comm. 2006; Peters pers. comm. 2007). Like the suction scar covered earlier, this mark is sometimes mistaken for a pontil scar but it actually has little similarity in appearance to any type of pontil scar (Toulouse 1969b). See the pontil scars page for a discussion of these base markings. (Note: Press-and-blow machine produced bottles and jars rarely if ever have ghost seams on the body since the parison mold for this type machine was one-part, i.e., the mold had no side seams (Miller & Morin 2004)). 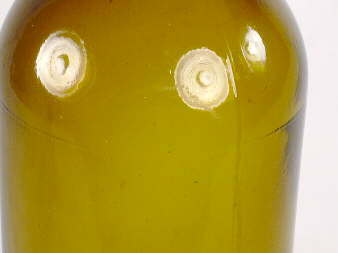 The bases of mid to late 20th century, machine-made bottles very commonly have a textured effect covering all or a portion of the base - see the image to the left. There were several practical reasons for this feature: the bottles would have a reduced base surface contact decreasing drag on the conveyor belts moving them within the glass factory and by purchasers/users; to hide product related sediment; to hide the suction scar (primarily on Owens Automatic Bottle Machine products); and for at least one specific machine operational reason (Phil Perry, engineer with the Owens-Illinois Glass Co., pers. comm. 2010). 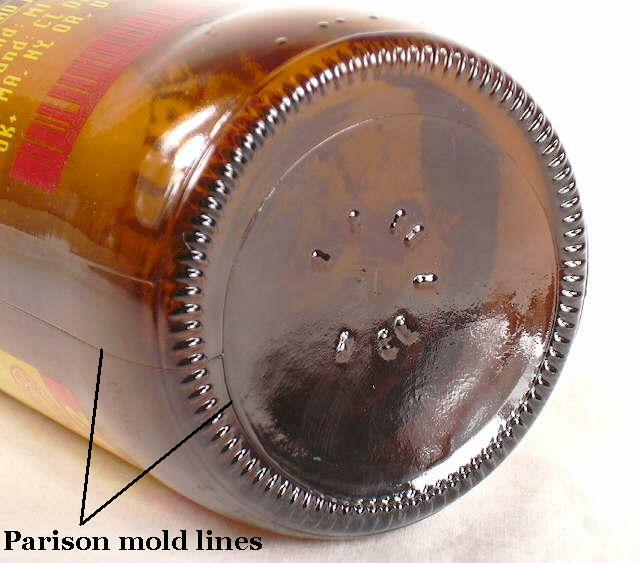 The noted conveyor belt utility would only involve the stippling on the resting surface of the bottle base - like that on the 1941 beer bottle base below where the stippling pattern is just on the outside base edge where contact would occur. Various stippling patterns were also added to bottle bases for largely esthetic reasons, such as the 1959 green soda bottle base to the left. None of the stippling - given the indented nature of the base center and lack of stippling on the resting surface - would have come in contact with the conveyor belt. ( )( )( )( )( )( ). 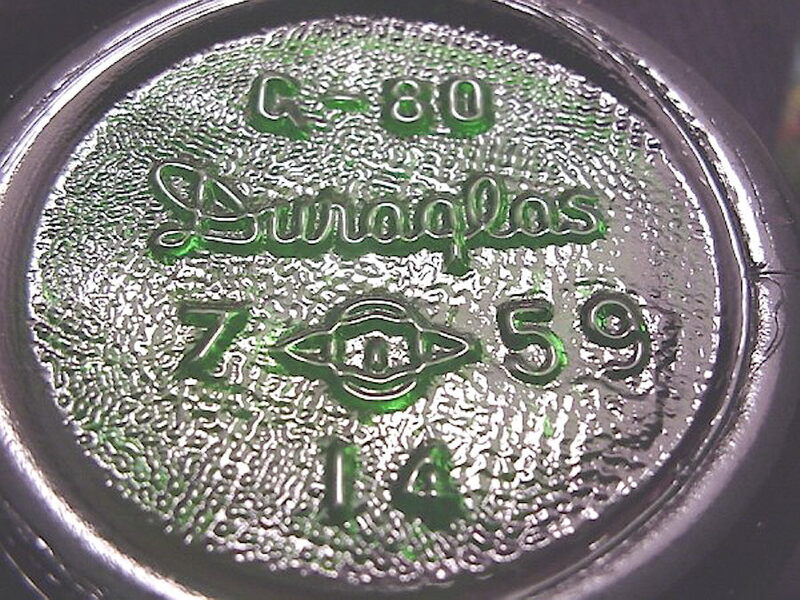 It is not precisely certain when this feature first originated although it likely first appeared in 1940 on bottles produced by the Owens-Illinois Glass Company when they began using their proprietary "Duraglas" bottle making process (Toulouse 1971). Both of the pictured bottle bases note such with the script Duraglas on the base. This likely terminus post quem is supported by date codes noted by the author and others on bottles made by that company (Lockhart 2004d; empirical observations). So if one has a machine-made bottle with a stippled base one can be quite certain that it dates from 1940 or later.